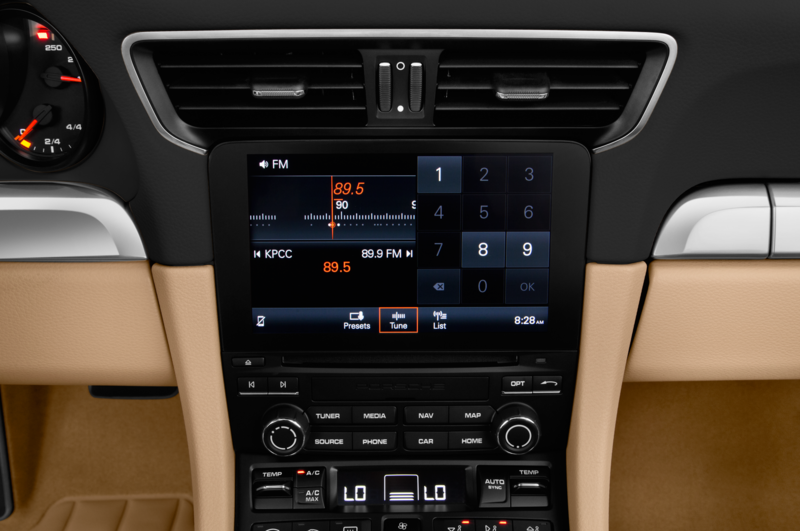 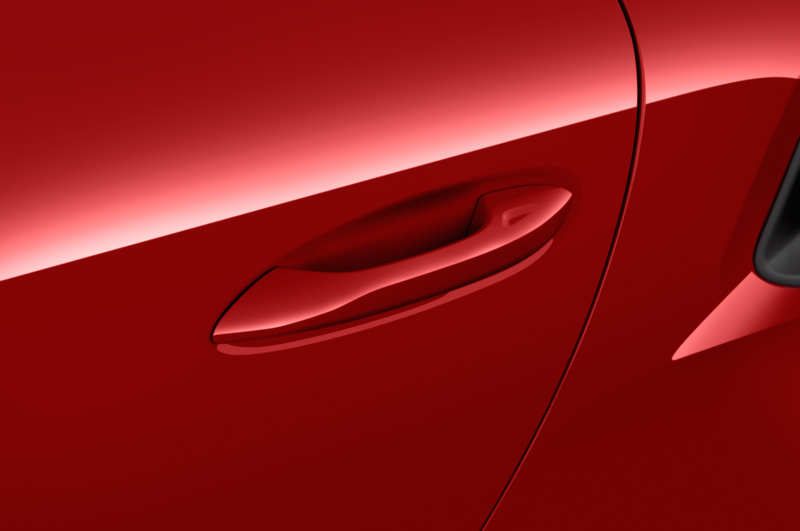 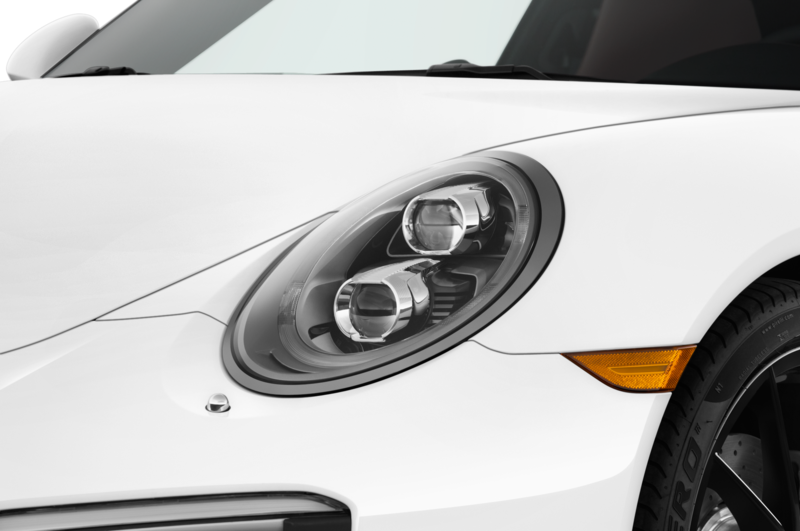 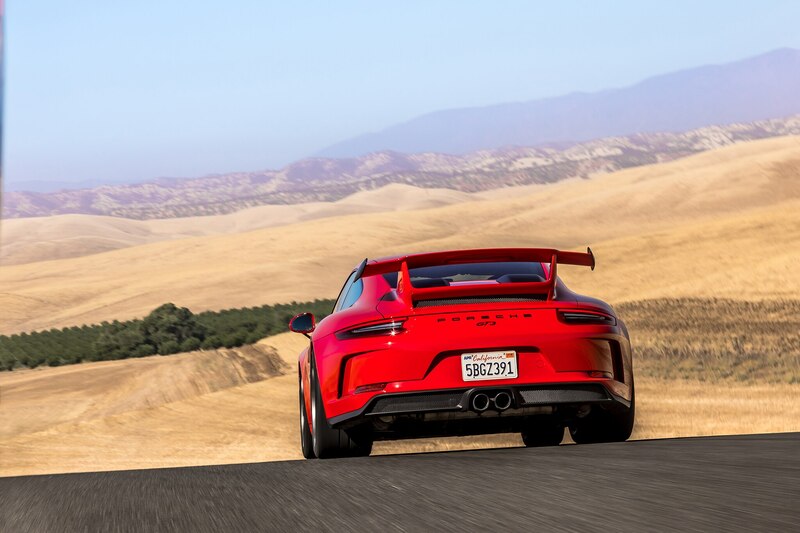 WILLOWS, California — Porsche’s GT products live a strange life, at least by Stuttgart standards. 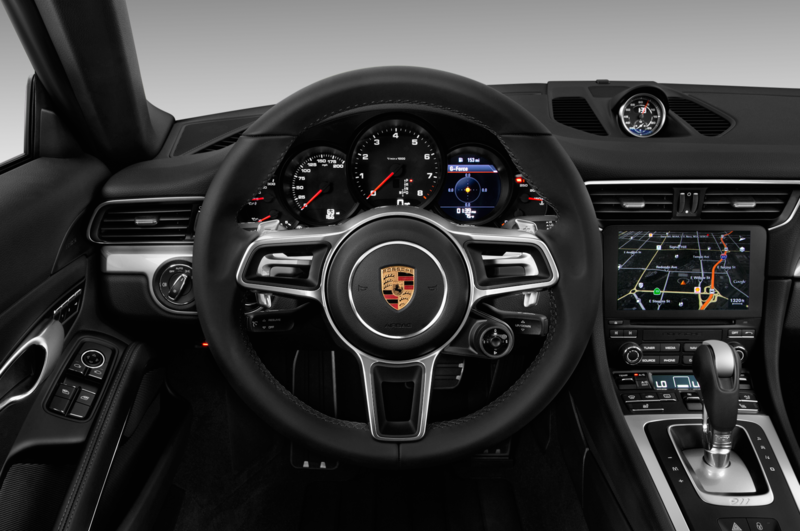 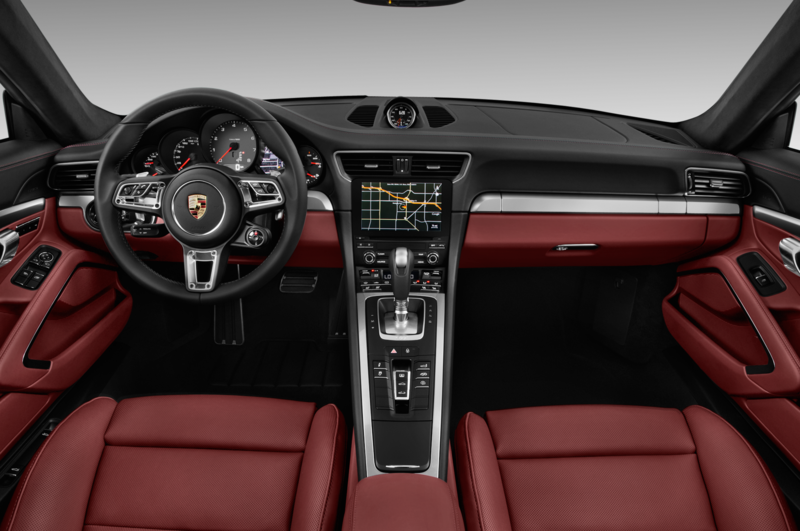 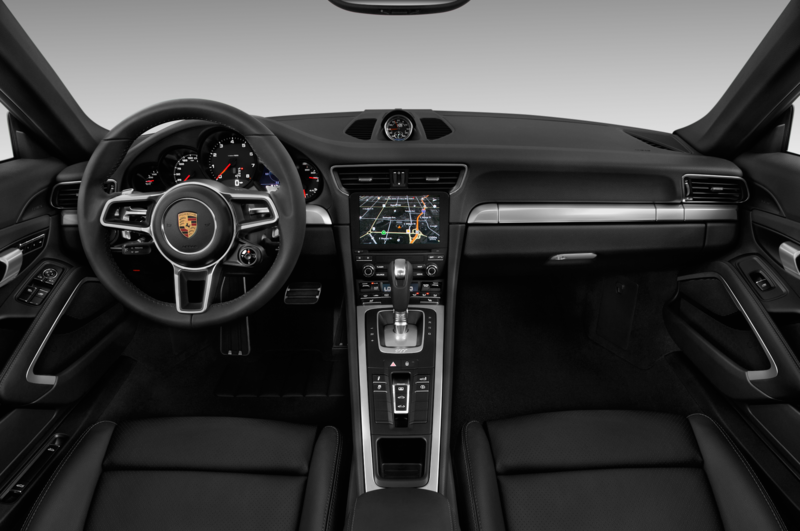 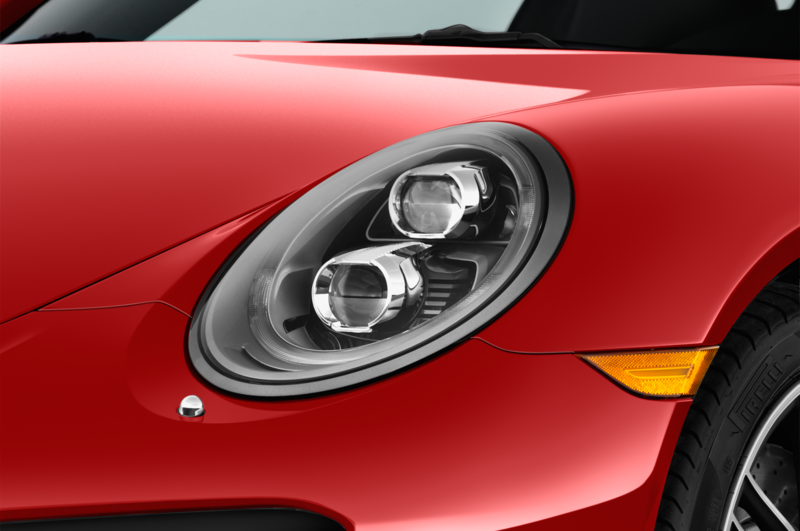 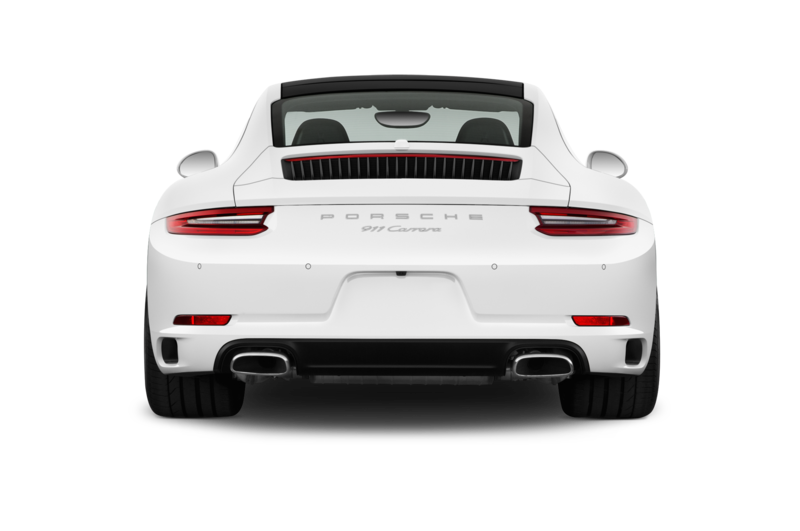 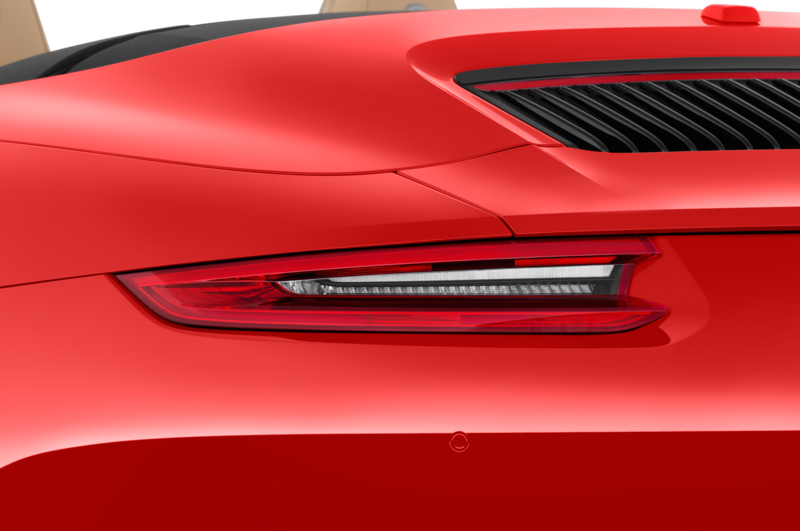 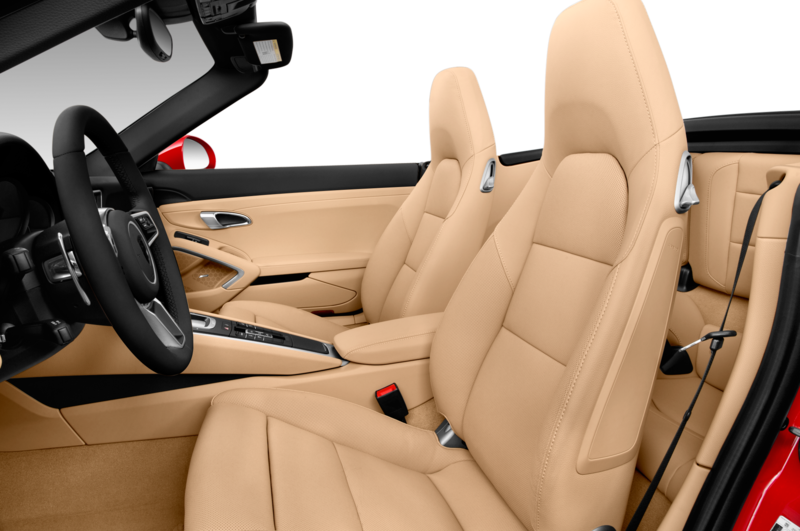 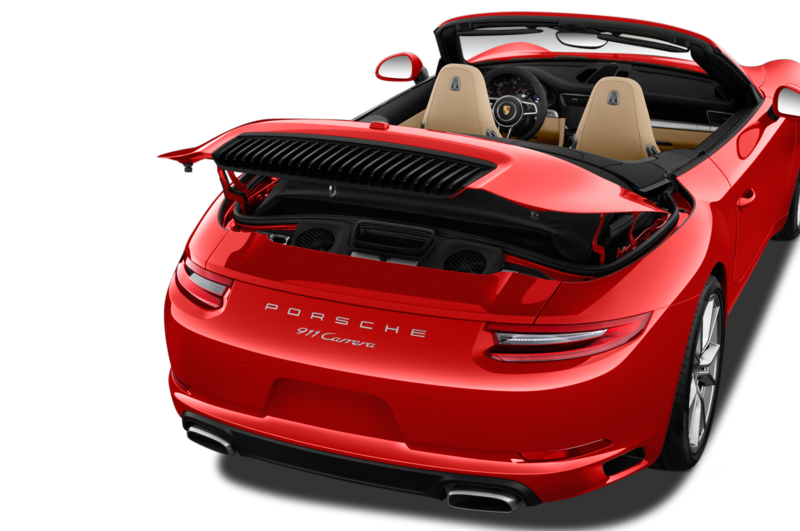 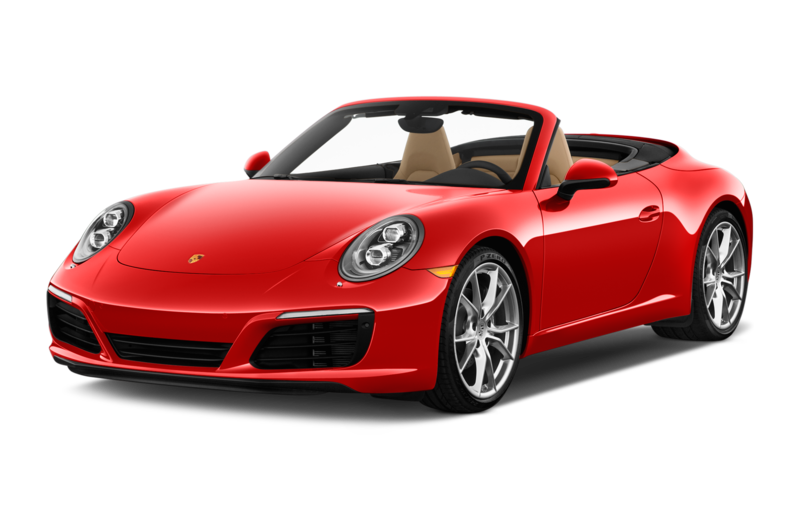 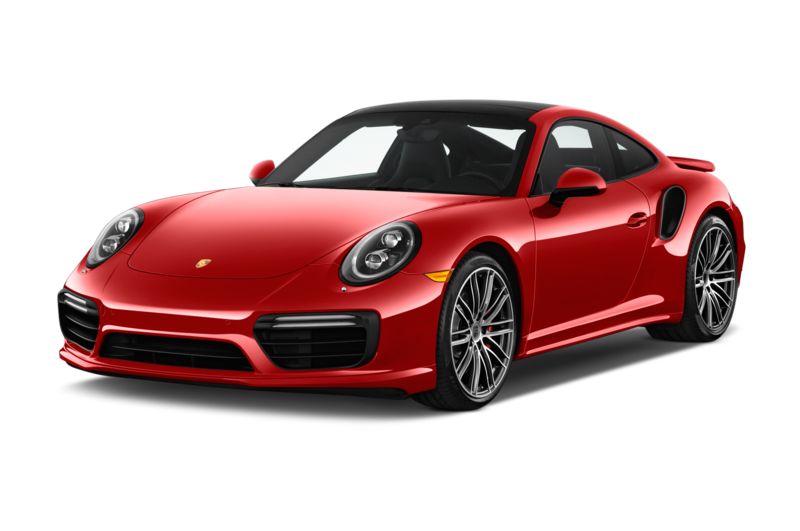 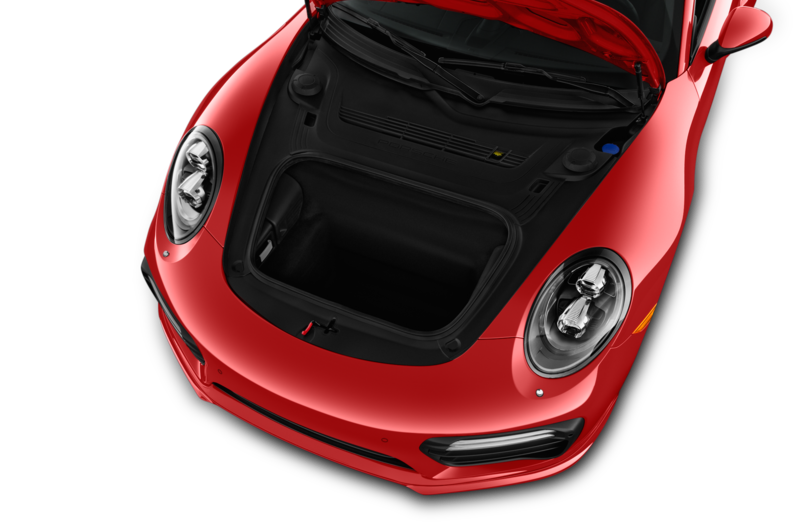 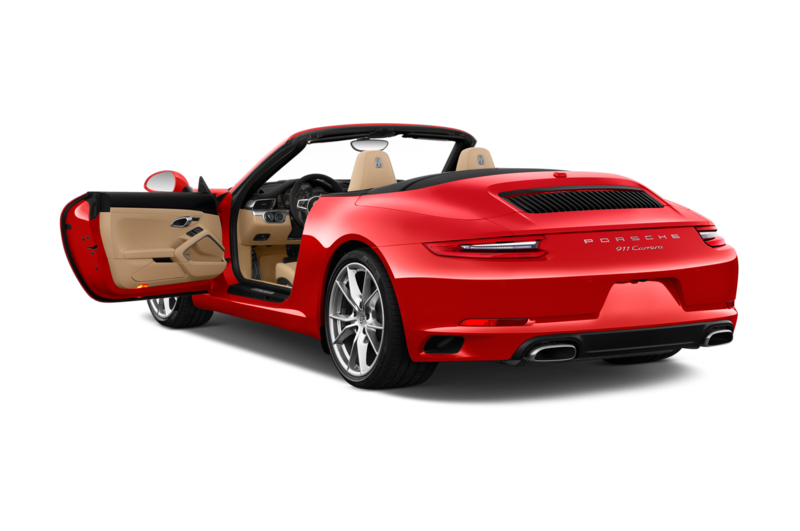 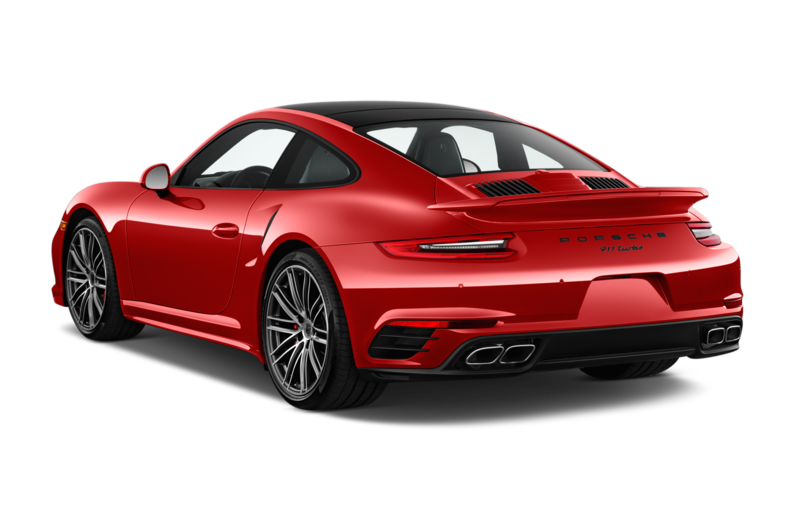 Sullen stares and whispered complaints—it’s not new enough, light enough, the steering isn’t as good—are the usual welcomes for a new 911. 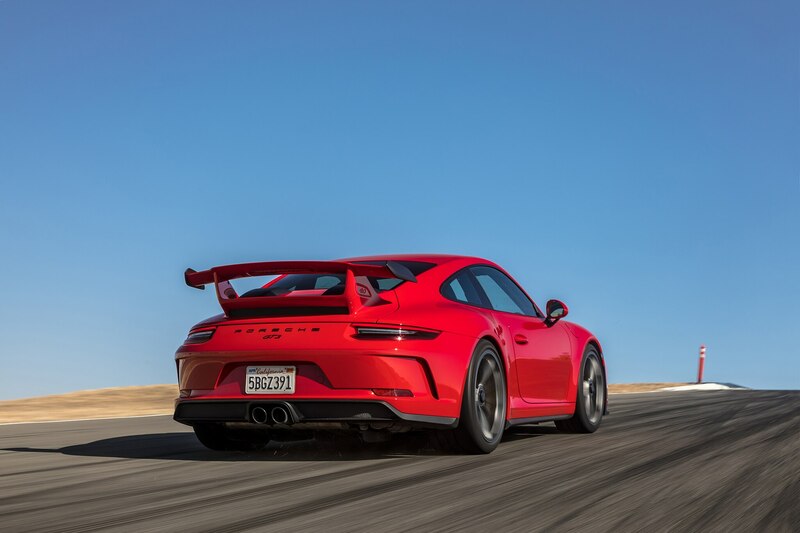 But the GT division can—and does—get away with murder (well, justifiable homicide, anyway; remember the reaction to the PDK-only 991.1 GT3?). 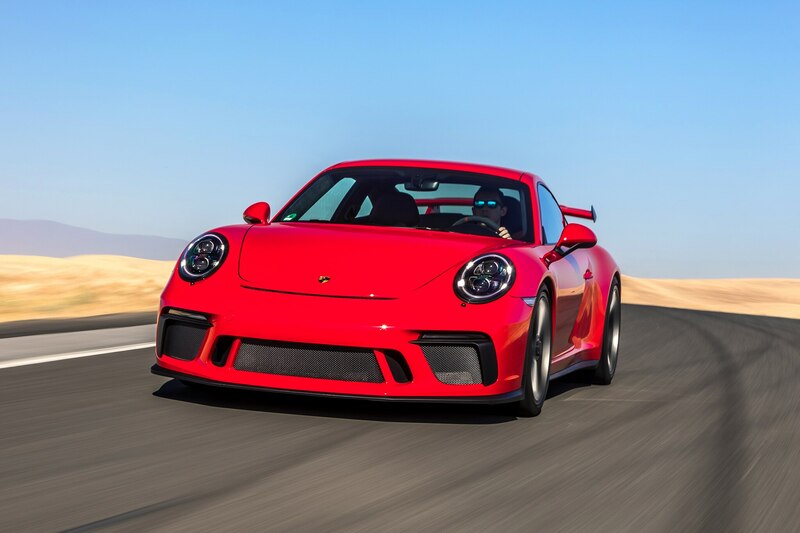 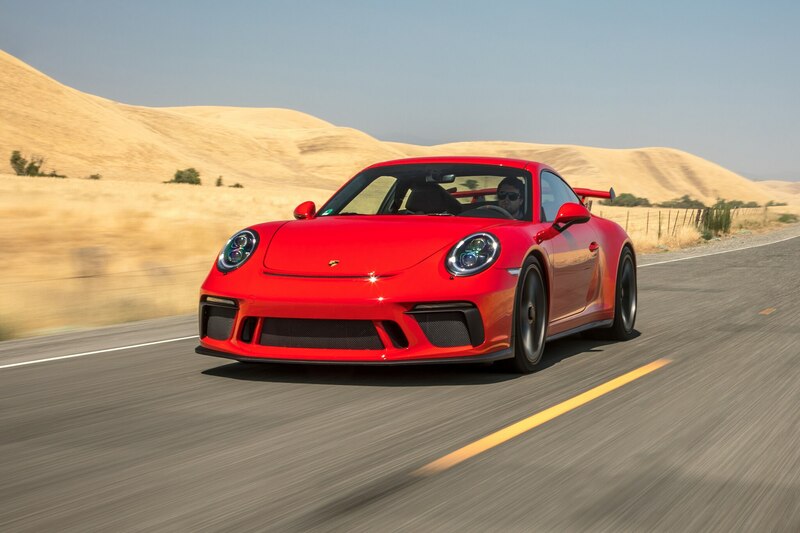 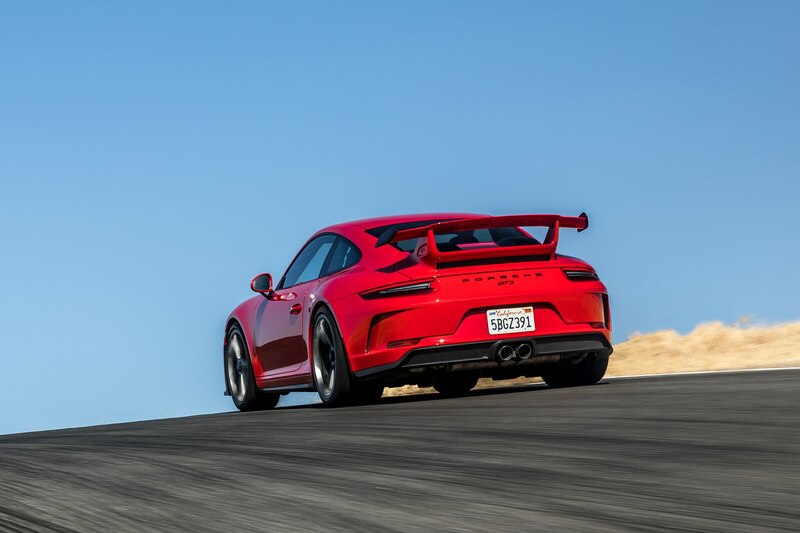 Each new regular GT3 or GT2 is heralded as the new “best,” outpacing, outrunning, and out-winging the now-obsolete predecessor. 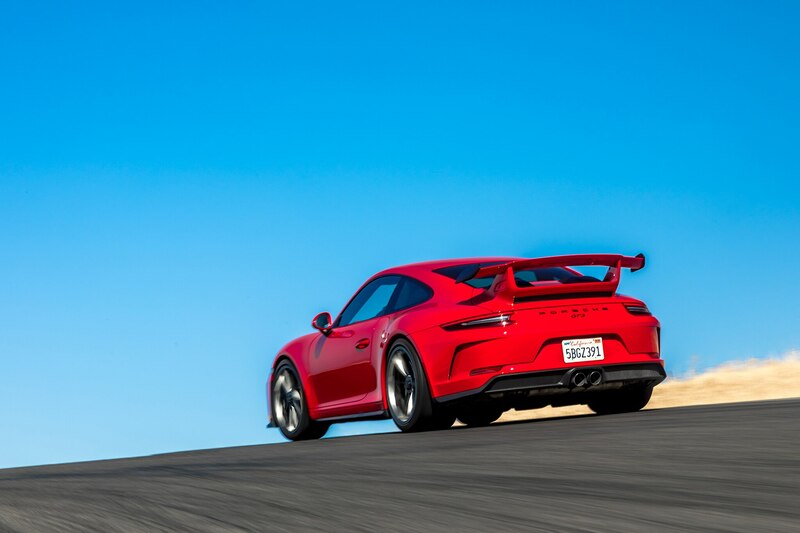 The 2018 Porsche 911 GT3 is the latest and greatest—and ostensibly one of the most hotly anticipated Porsches in recent memory. 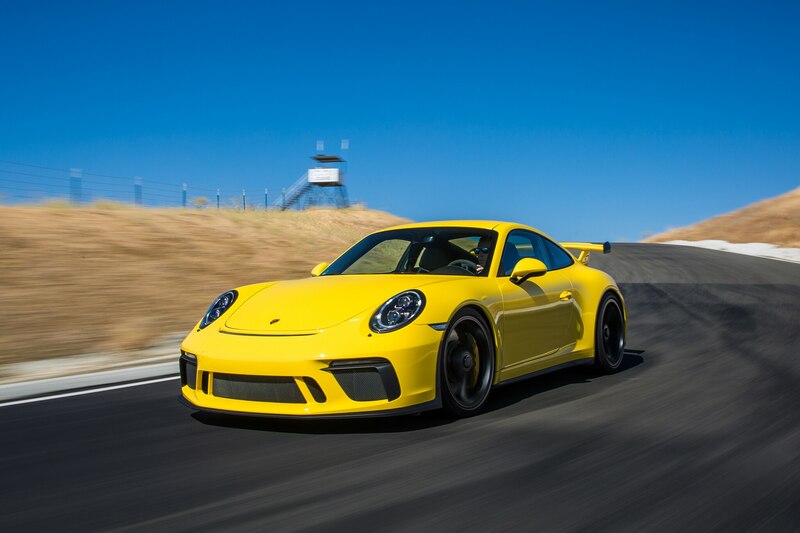 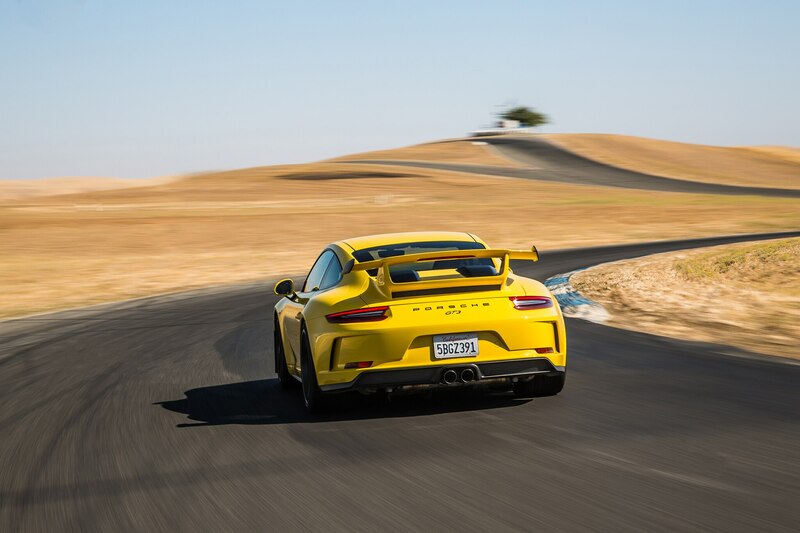 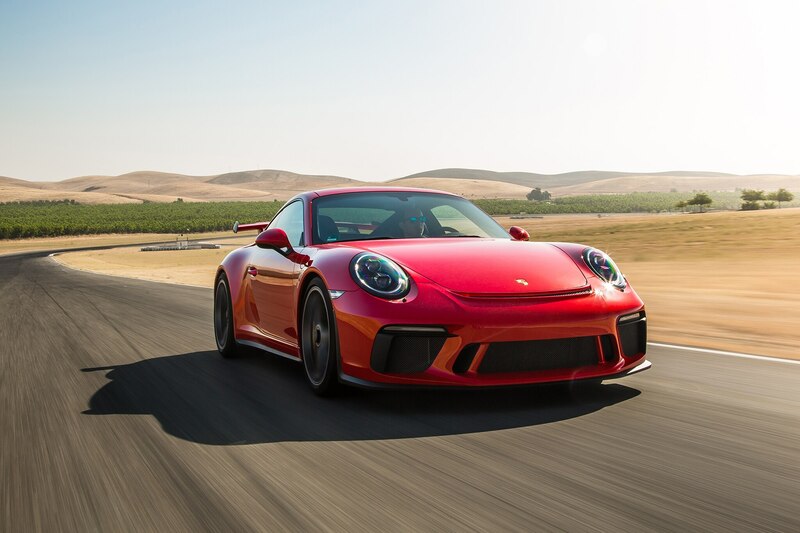 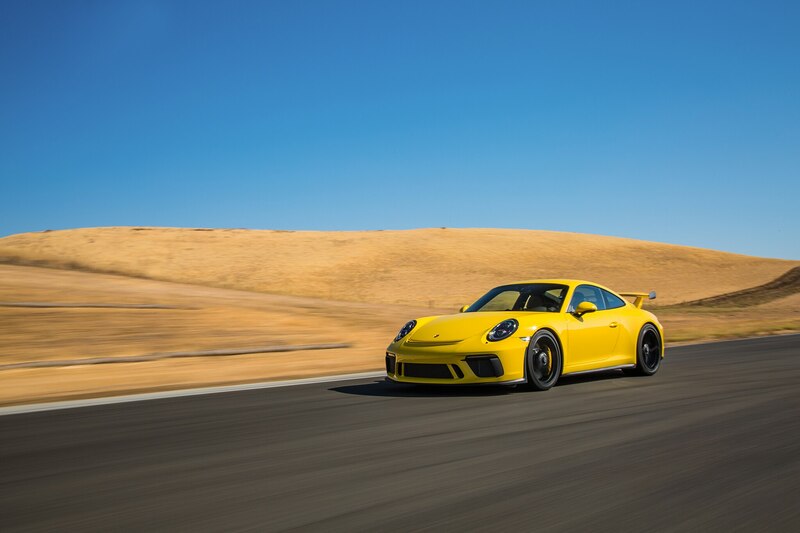 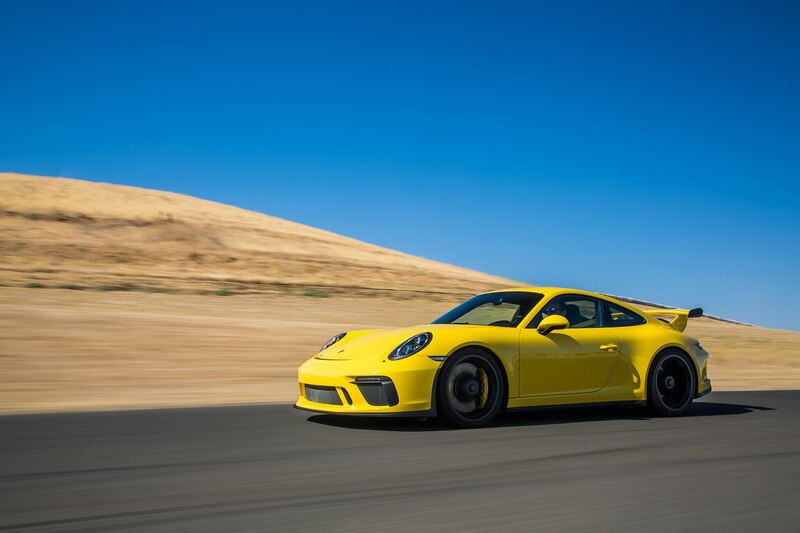 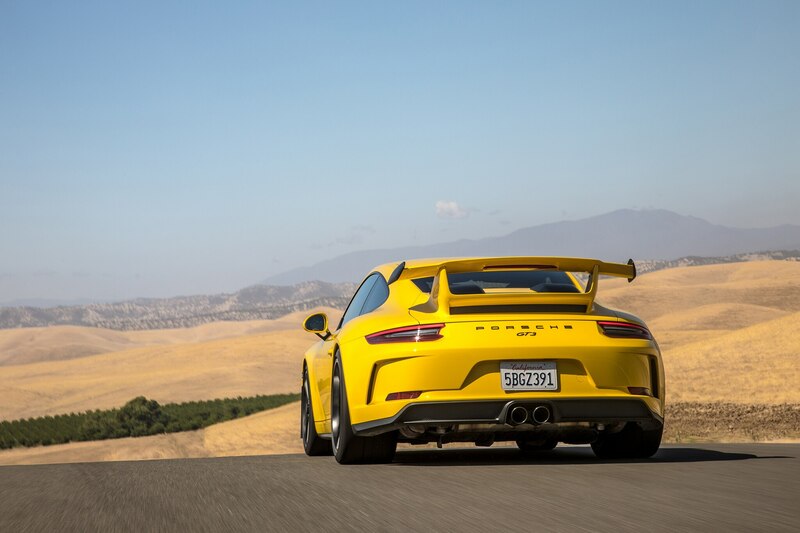 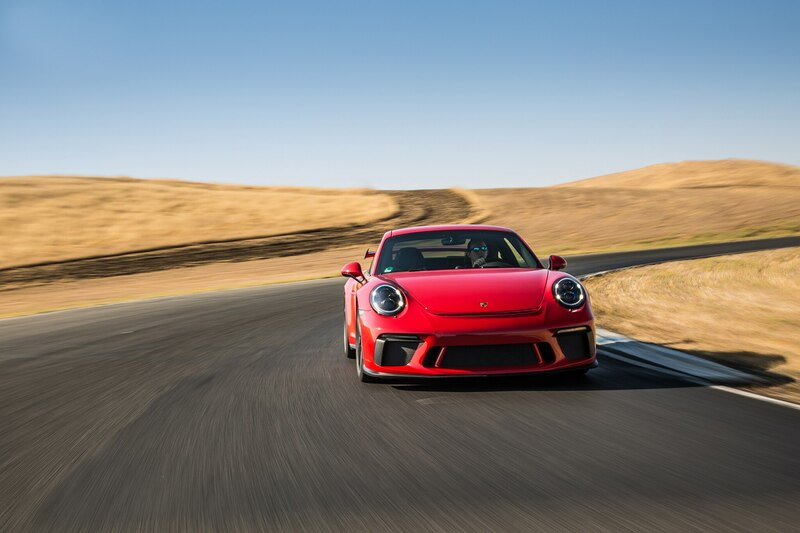 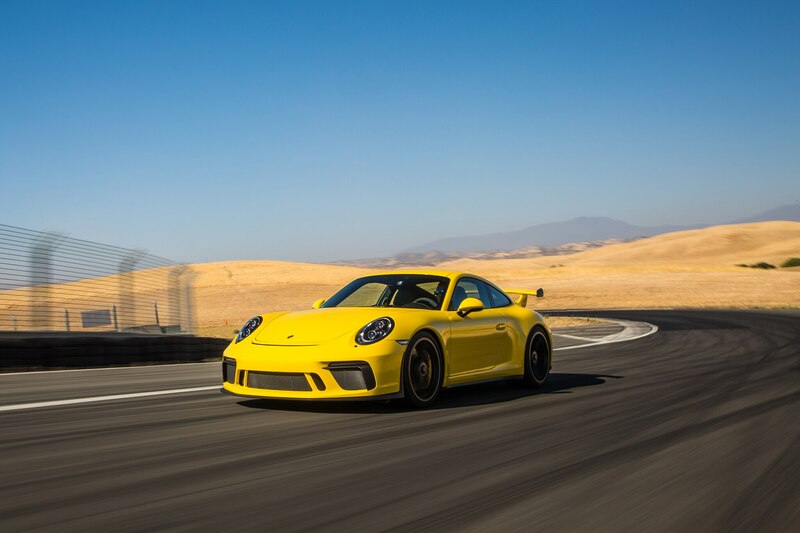 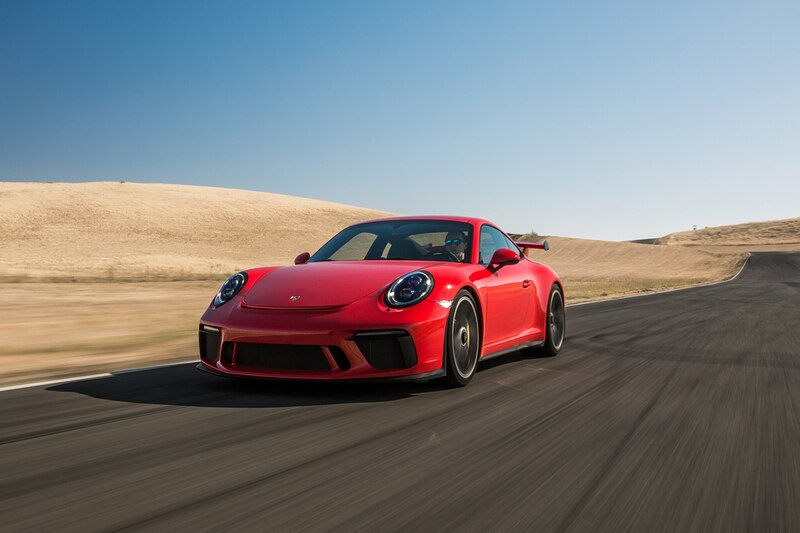 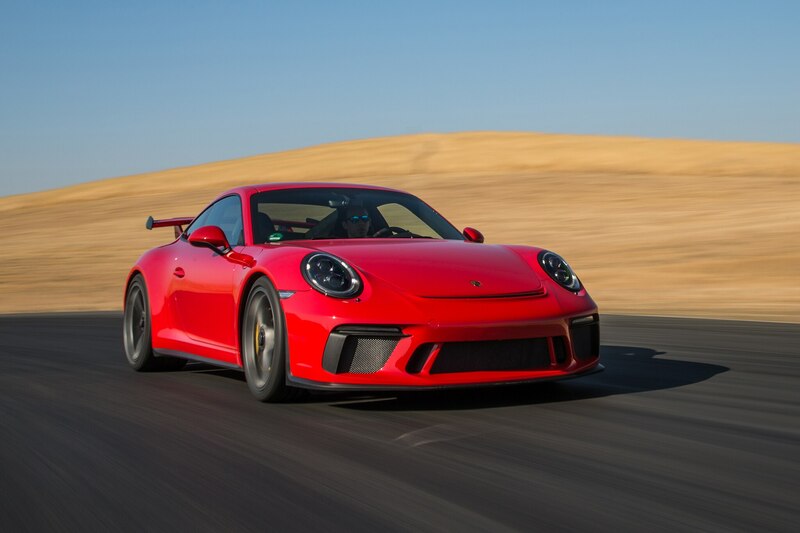 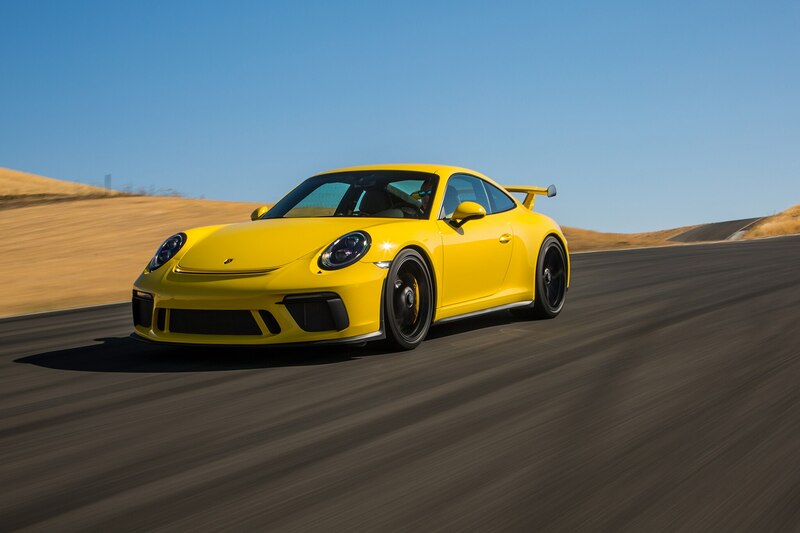 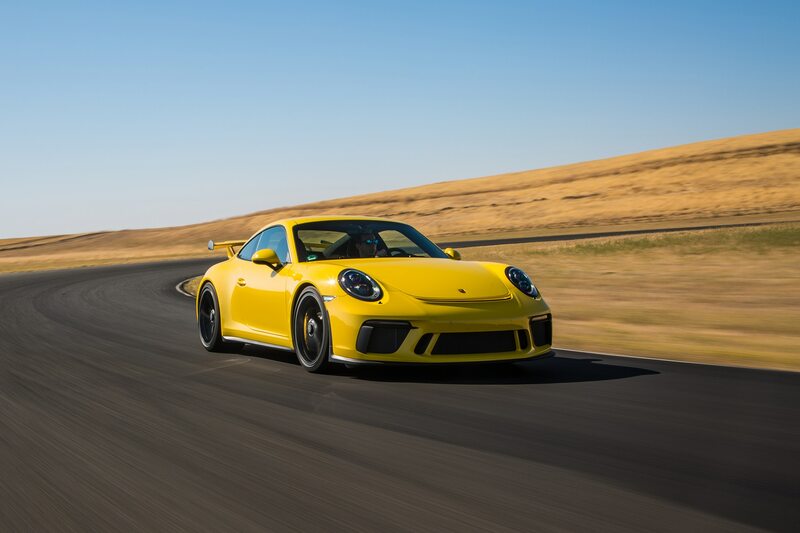 We drove the new GT3 earlier this year, but Porsche flew four 991.2 GT3s from Germany, cleared out Thunderhill Raceway, and let us have another go before the start of 2017’s Pebble Beach festivities. 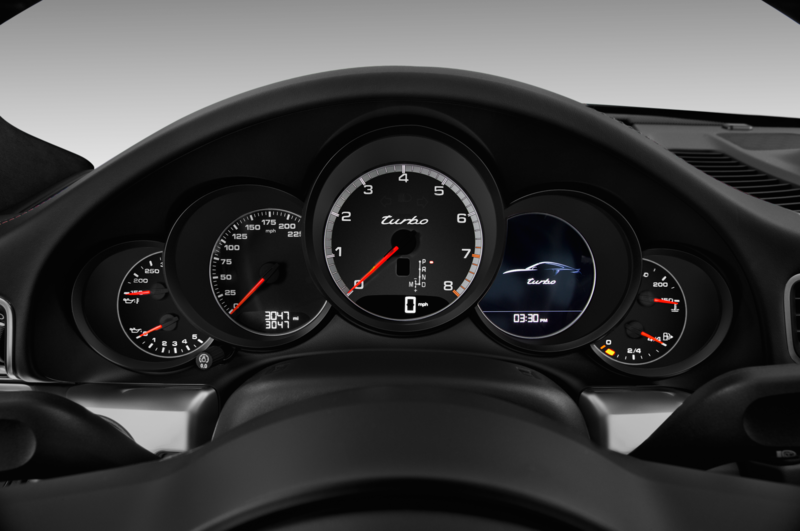 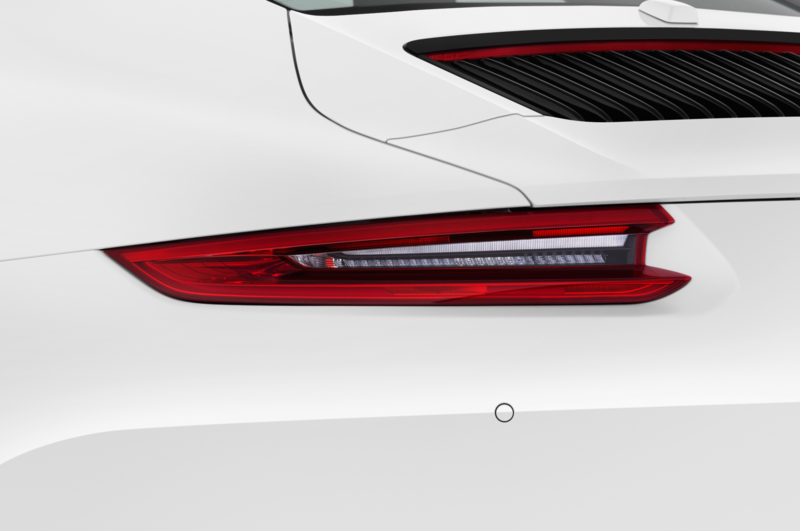 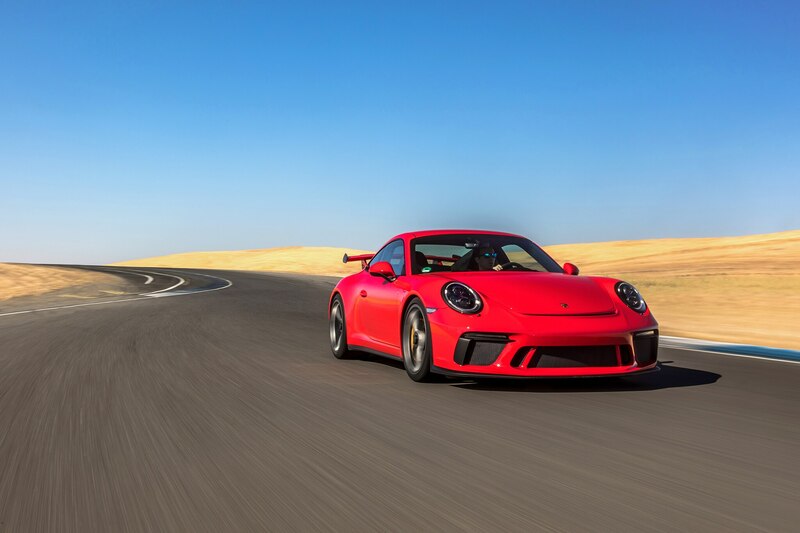 The 991.2 GT3 was announced during a time of political unrest for Porsche, when controversy surrounding the limited 911 R was reaching a fever pitch. 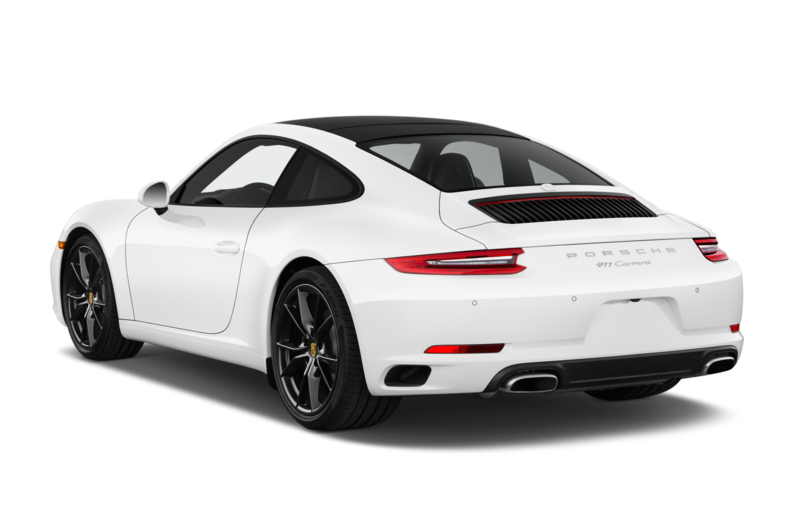 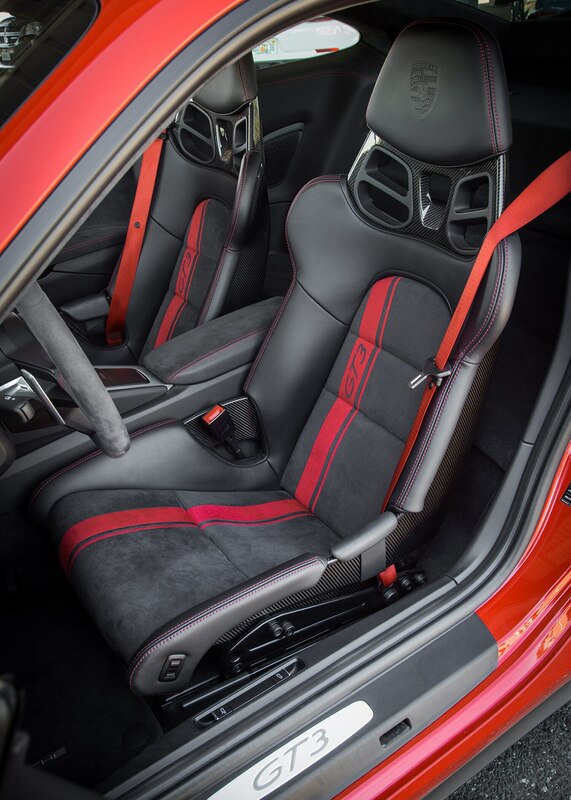 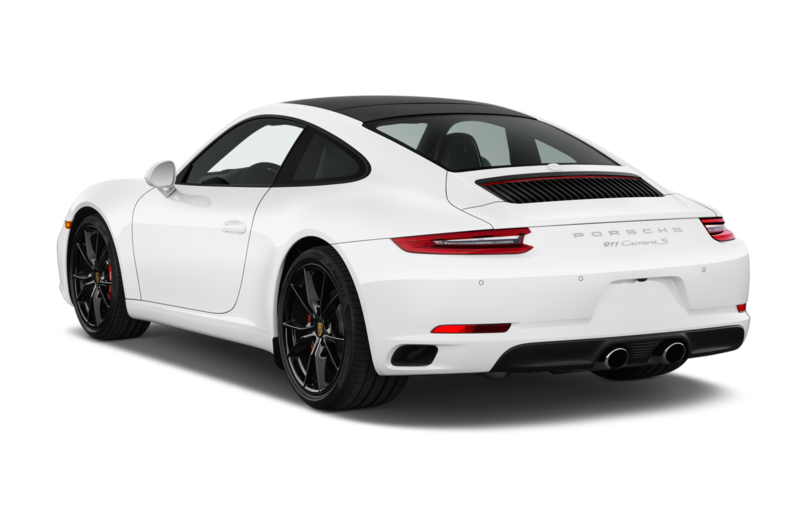 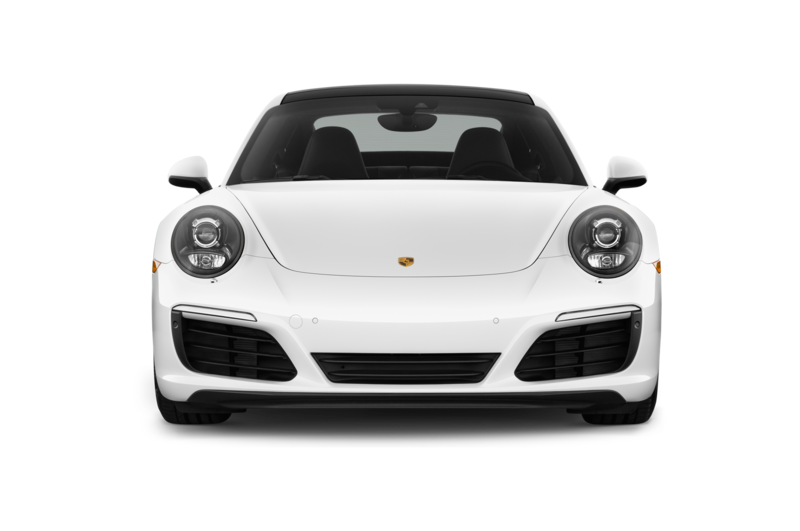 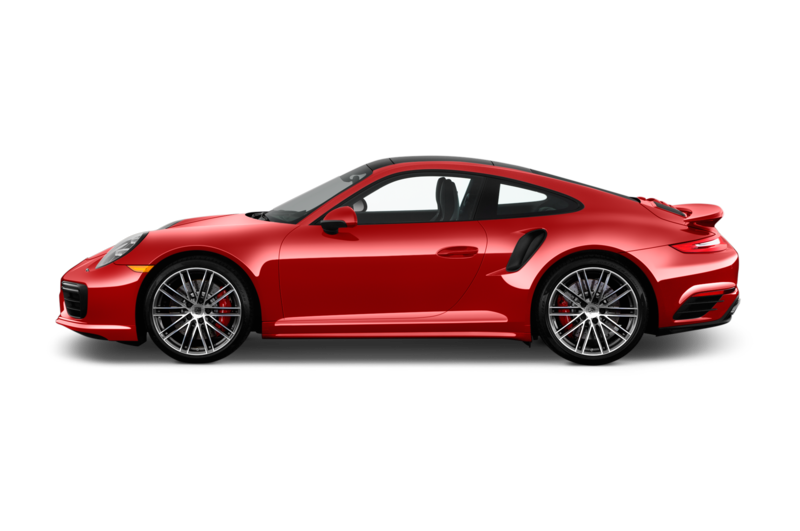 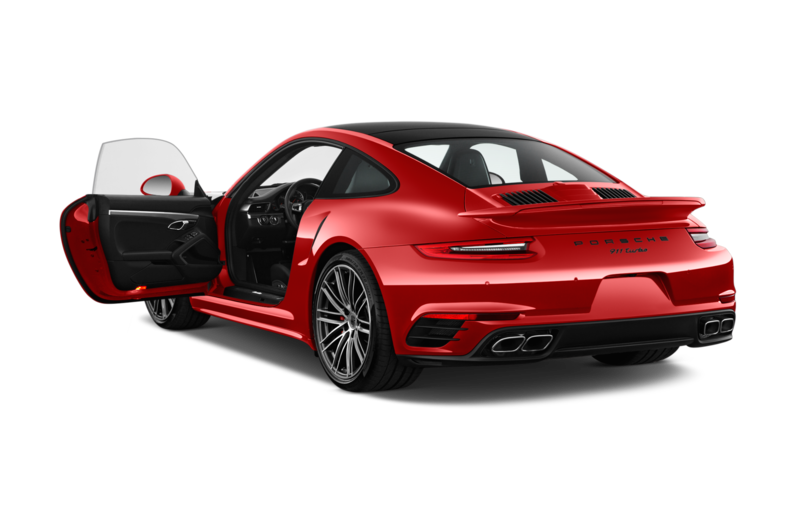 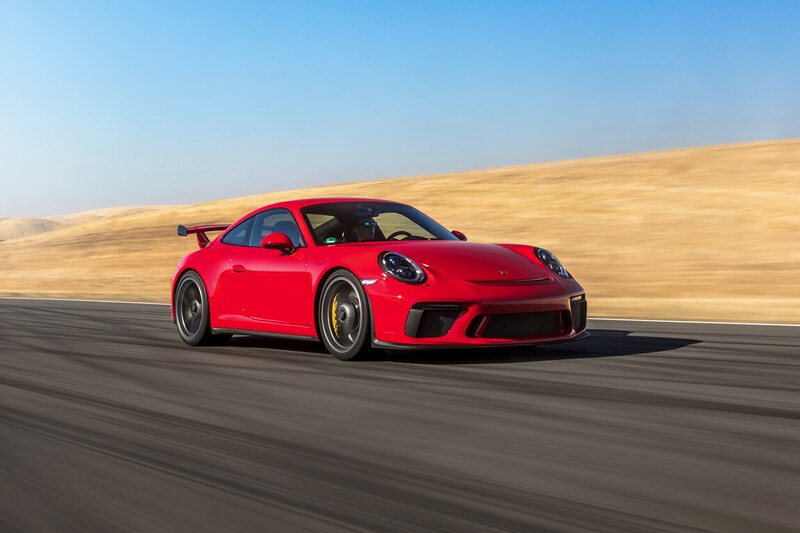 The R was a fabulously retro, ultra-desirable special edition 911 that packed a variant of the GT3 RS’ 4.0-liter engine, but featured a six-speed manual transmission in place of the 991.1 GT3’s aforementioned PDK dual-clutch transmission. 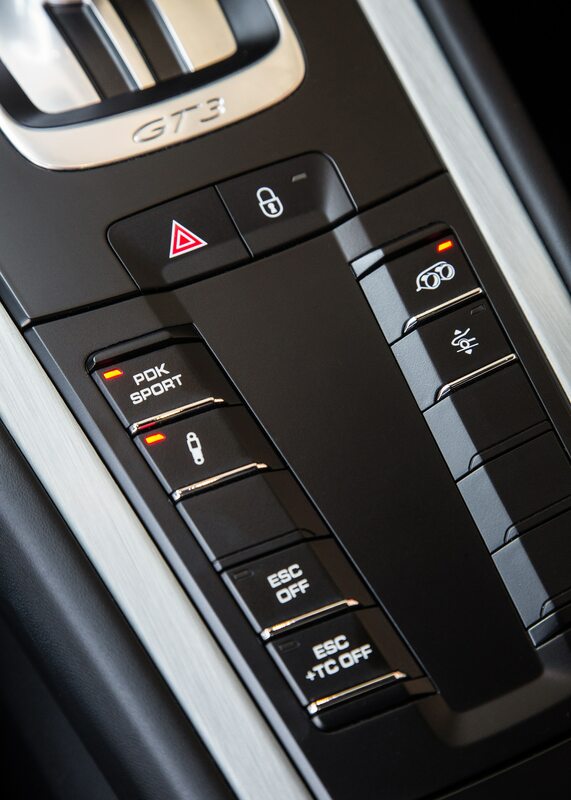 At the time, this was the only way to get GT3 RS hardware with the stick, so demand was explosive. 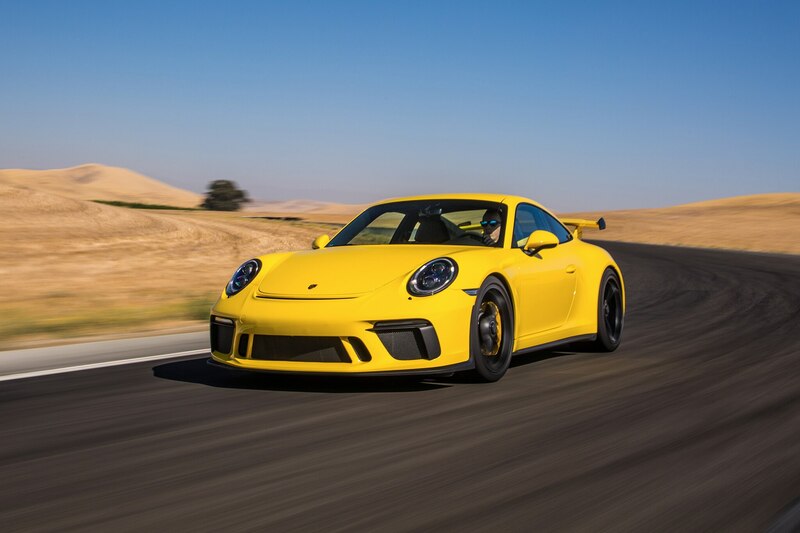 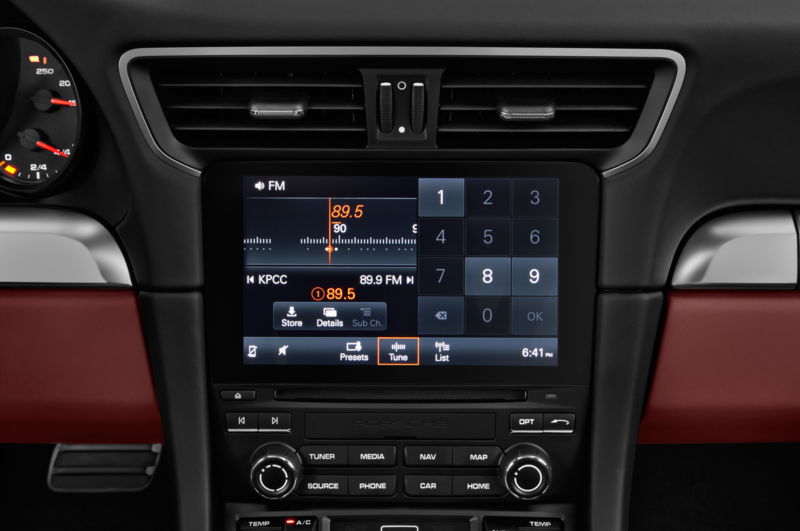 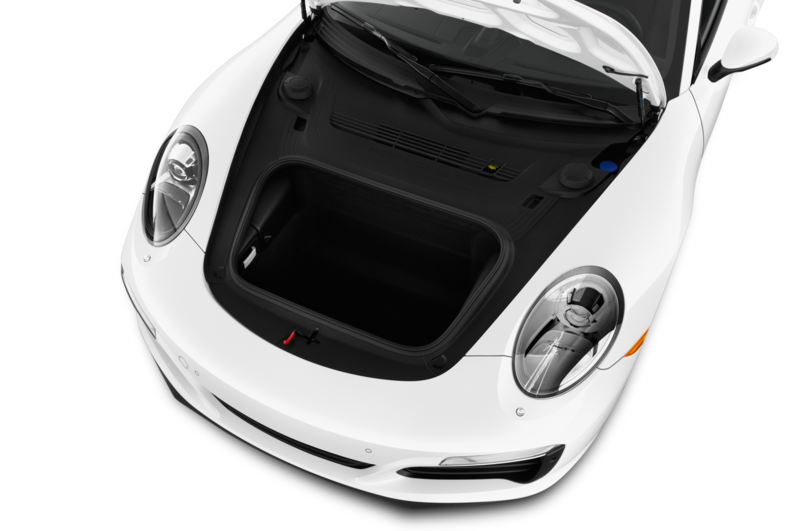 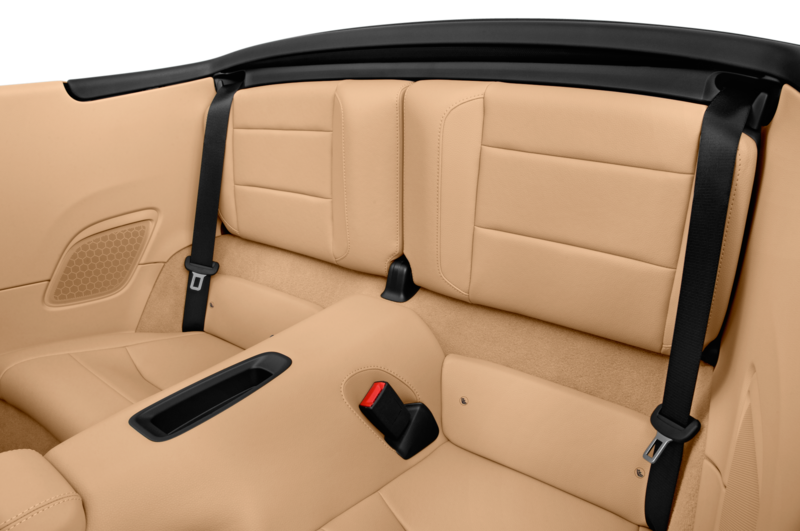 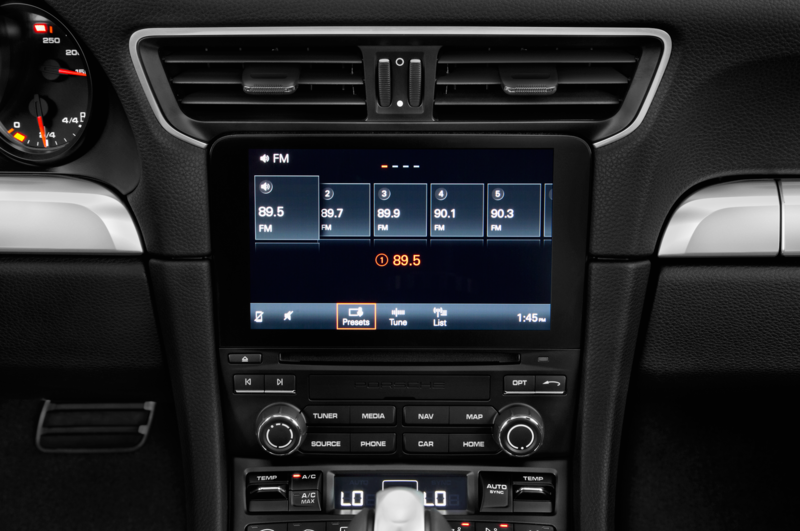 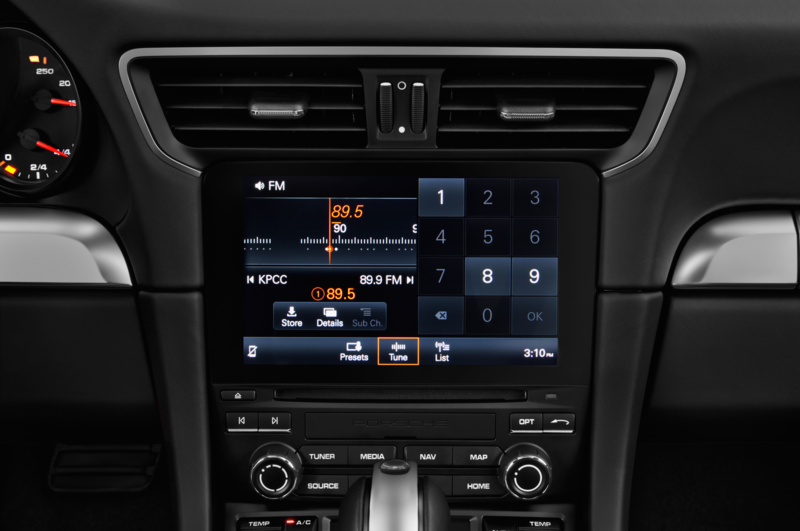 The car, which started at a considerable $185,950, was limited to just 991 units and was almost entirely sold out before it hit the auto show floor. 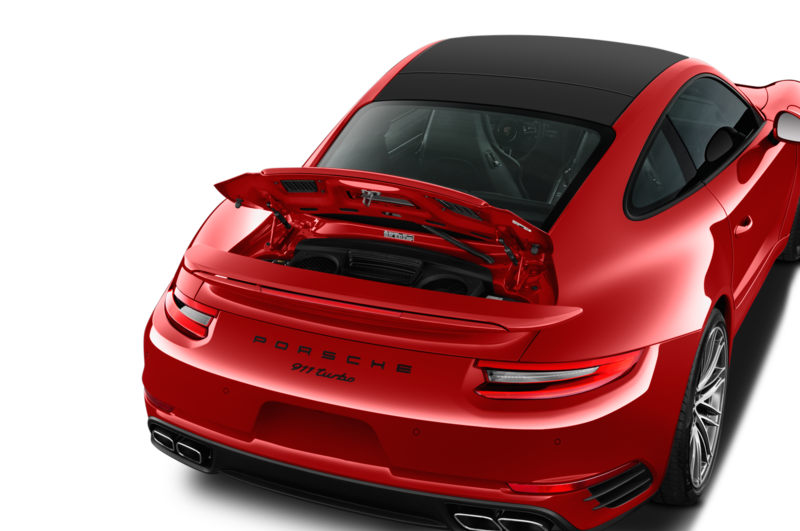 Havoc ensued as collectors, speculators, and looky-loos threw seven-figure sums at well-optioned Rs. 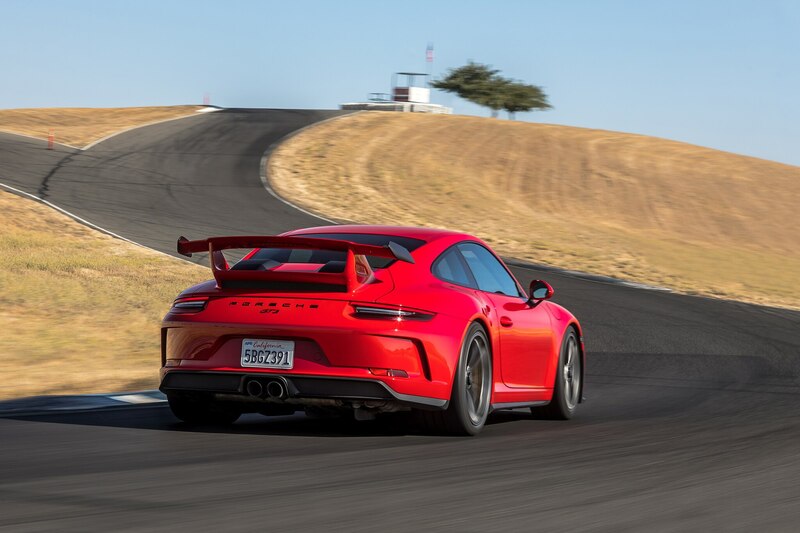 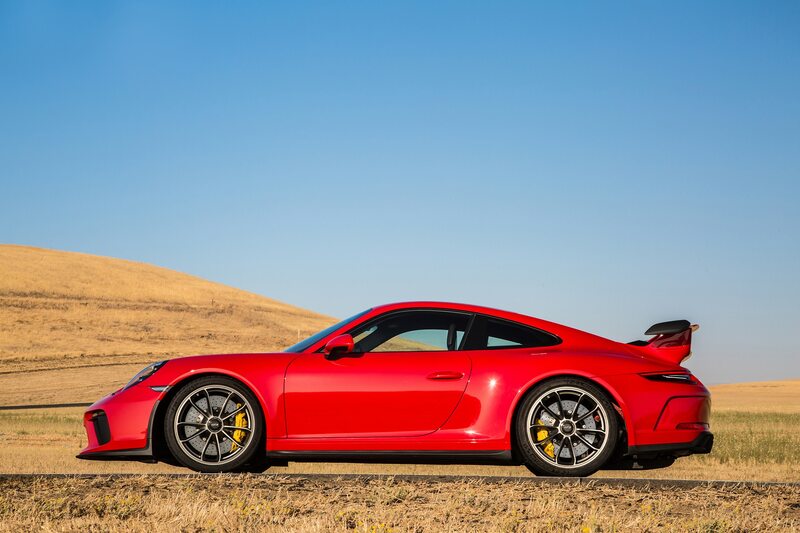 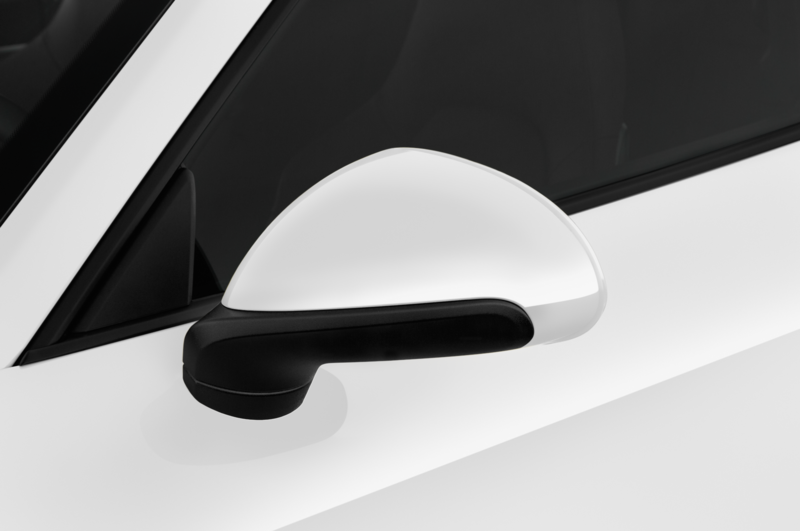 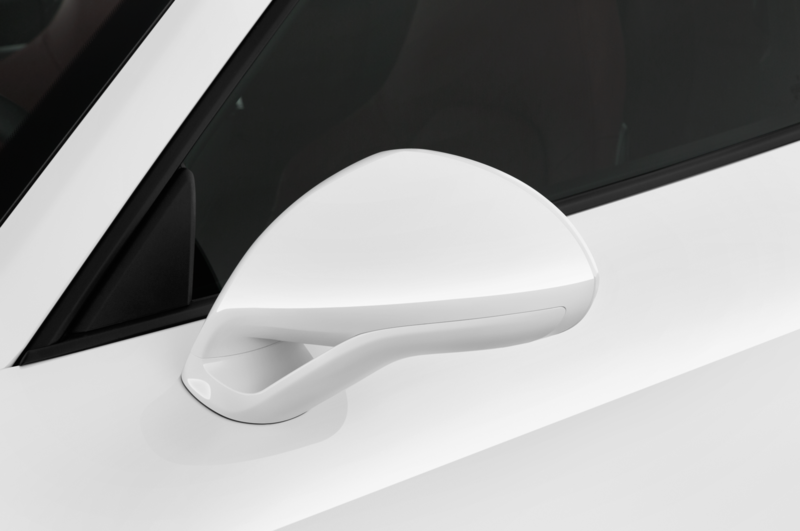 As it turned out, the 2018 GT3 was the perfect pressure valve for the market. 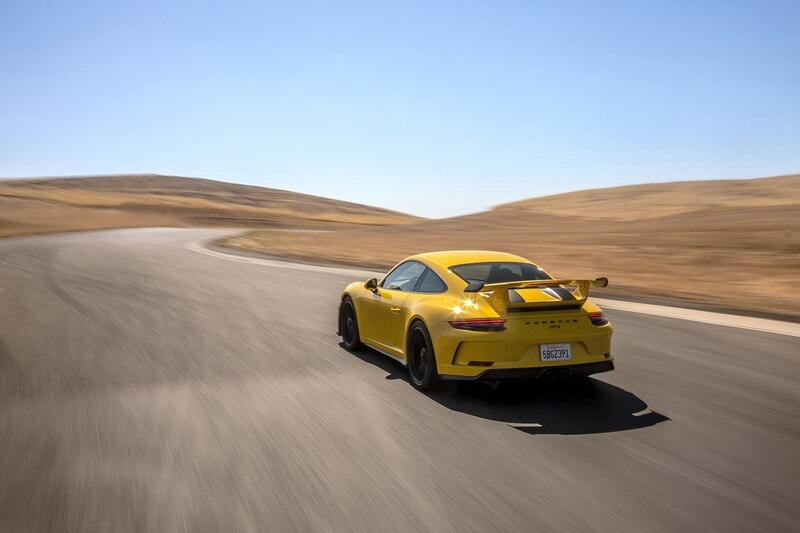 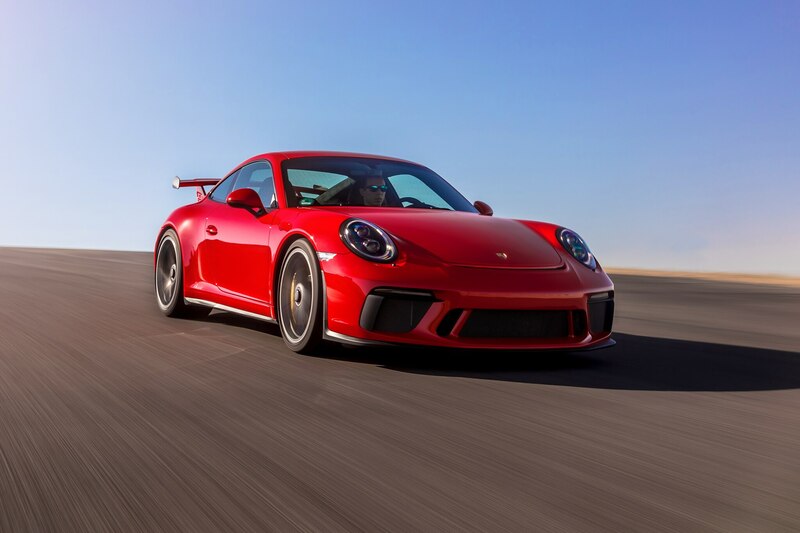 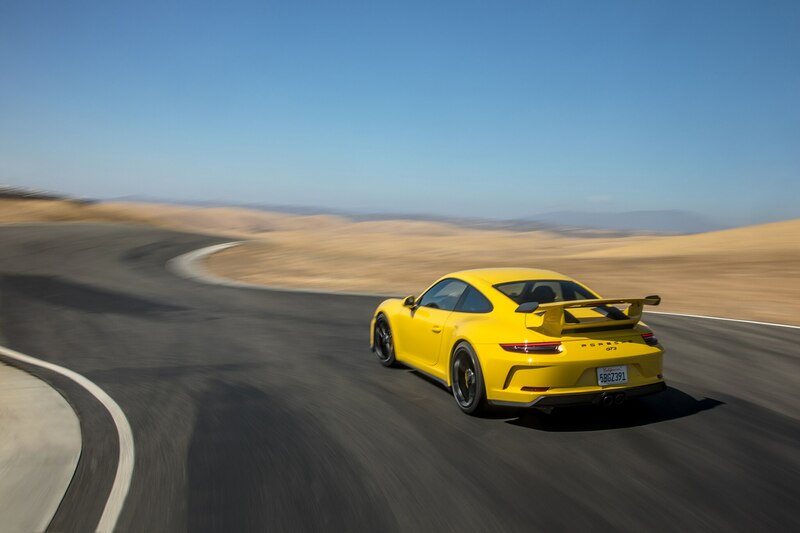 For the new generation, the six-speed ‘box and an evolution of the 4.0-liter from the R and RS is the new norm, leaving the 991.1 GT3 the sole PDK-only generation—for now. 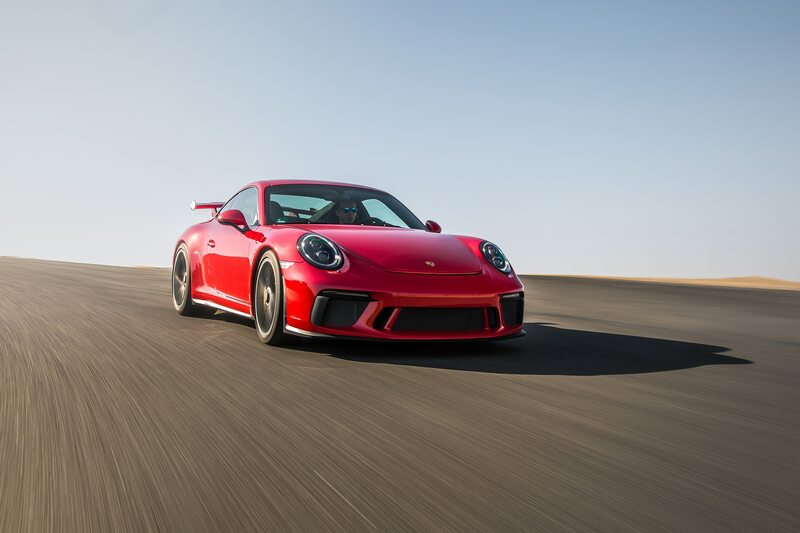 With the manual back in the GT3, the bubble was lanced, and prices of the R have subsided below the half-million mark. 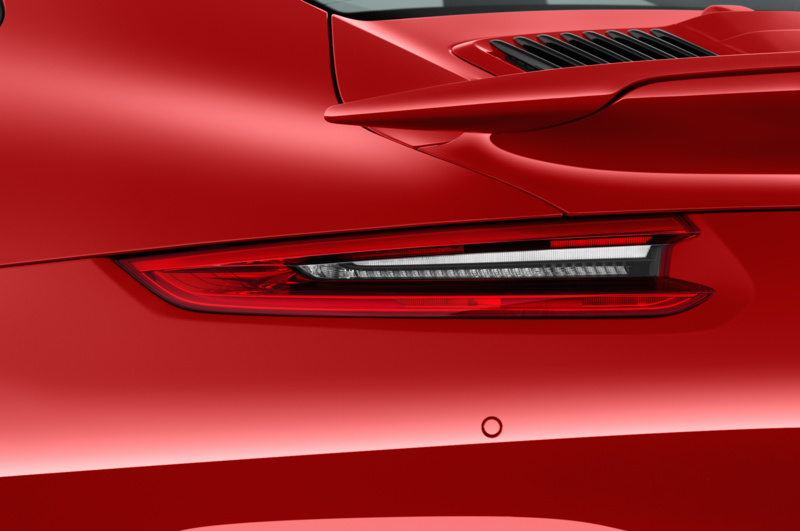 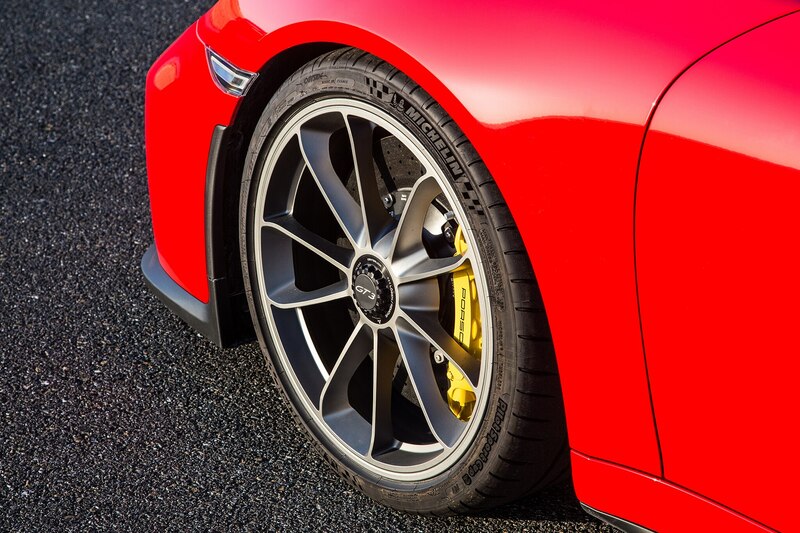 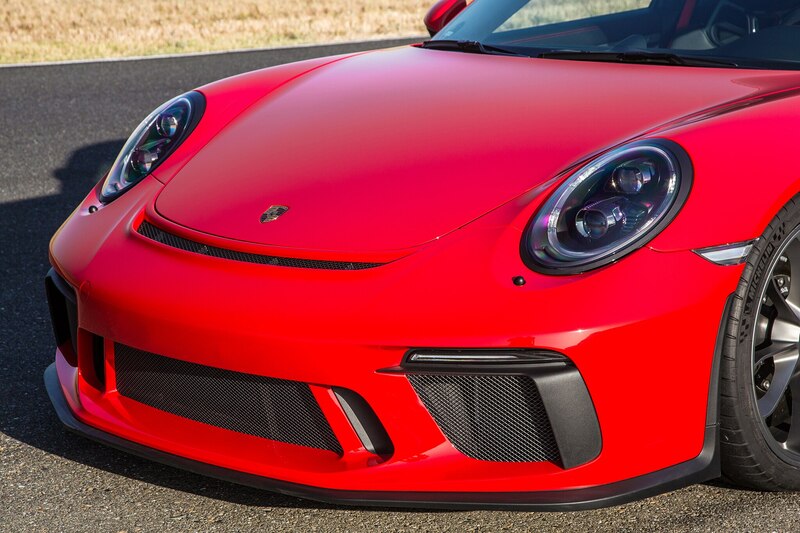 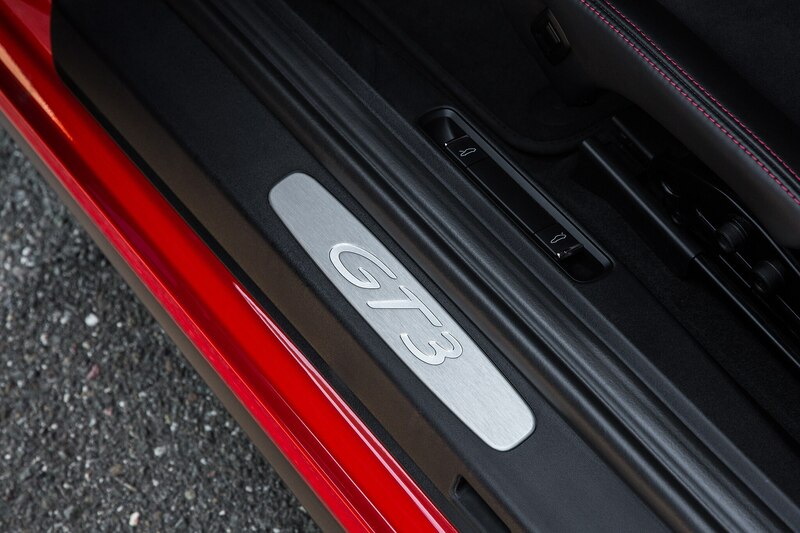 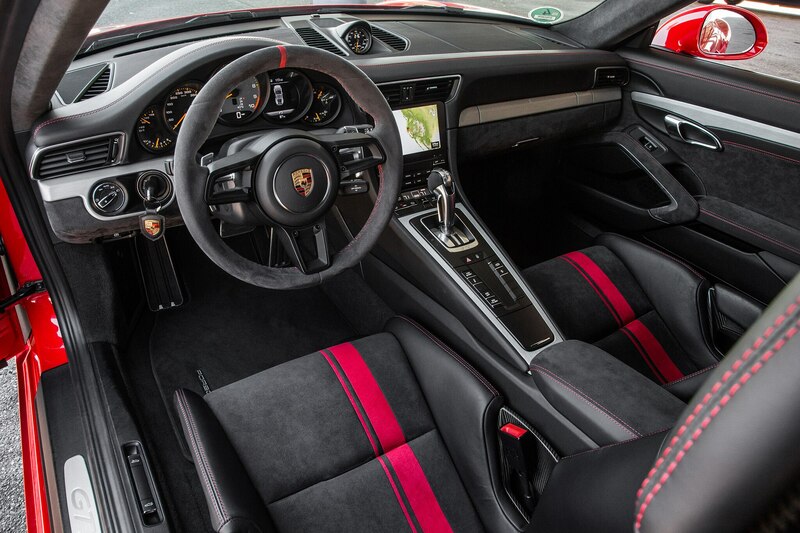 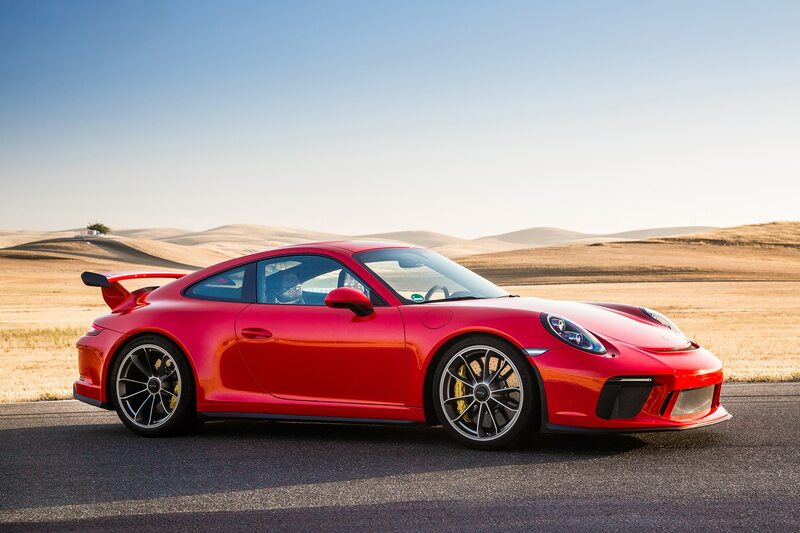 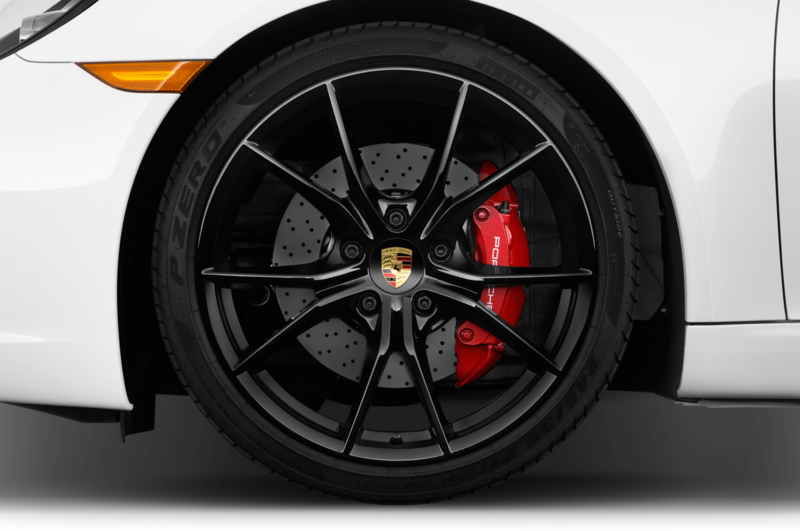 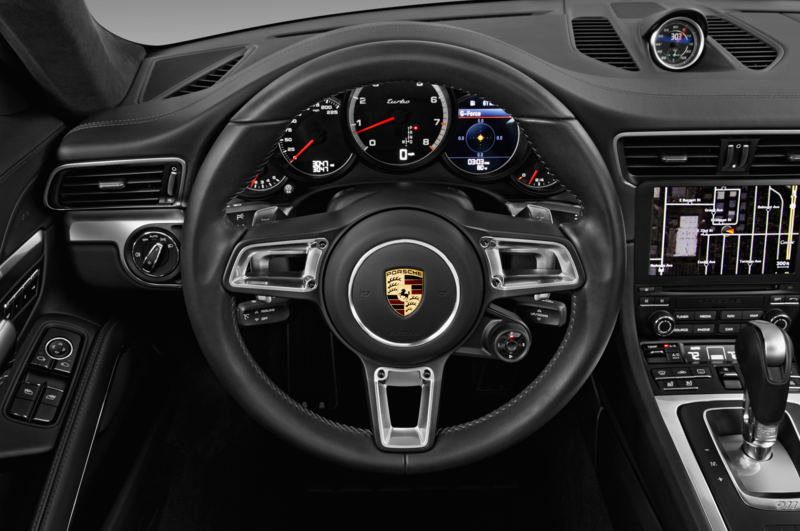 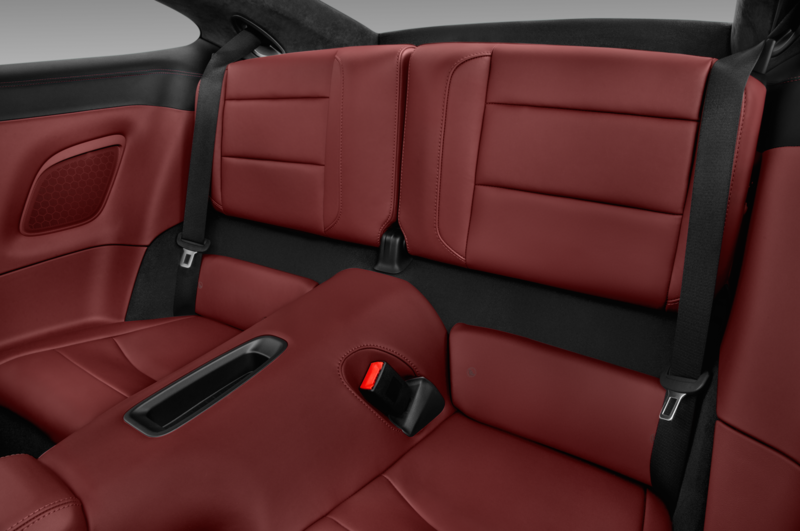 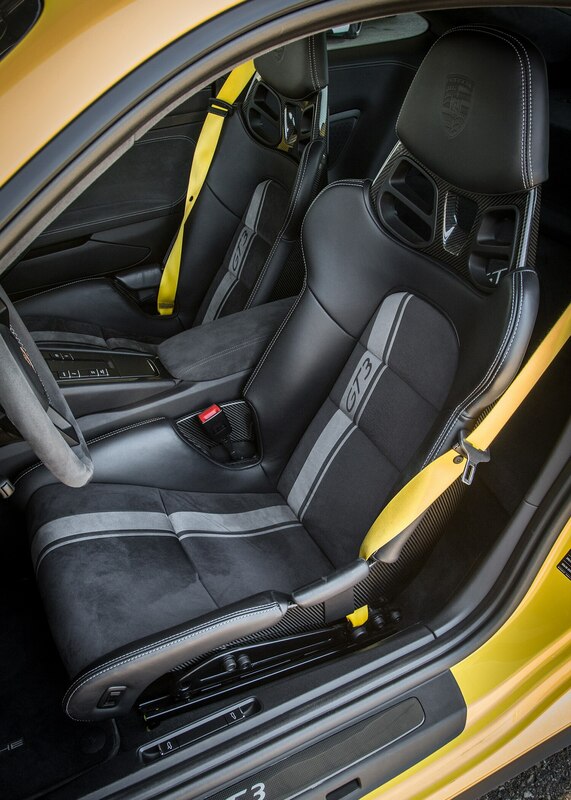 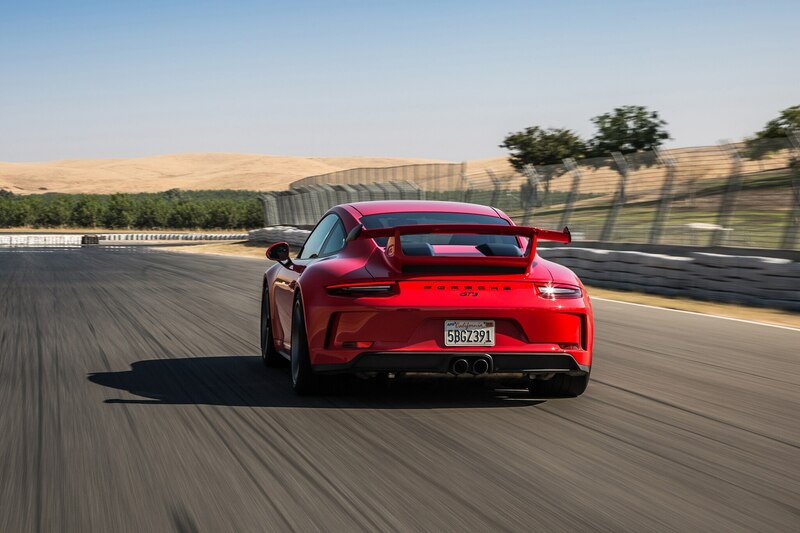 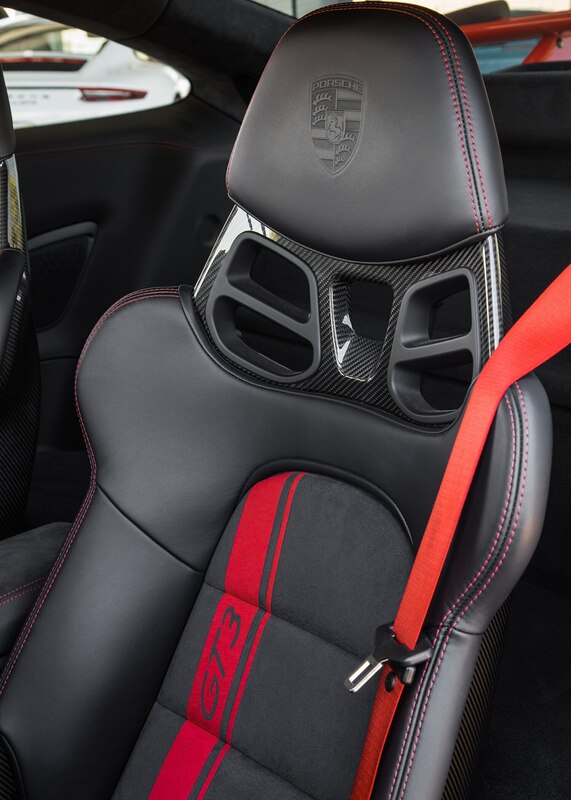 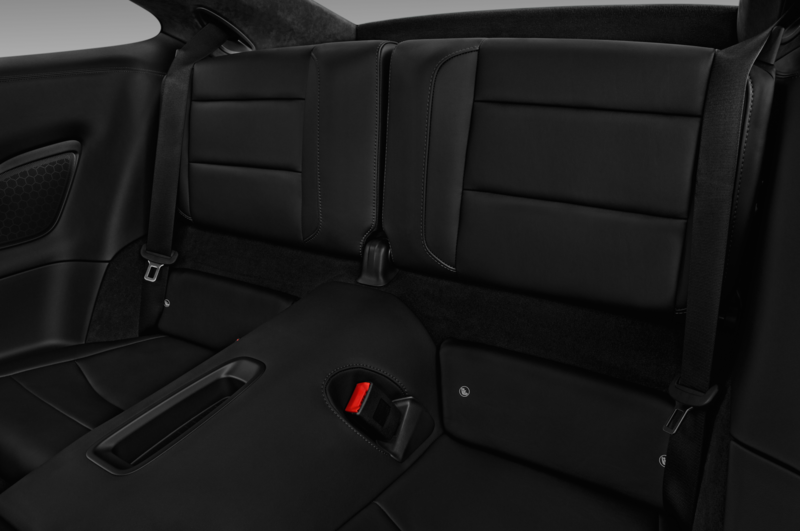 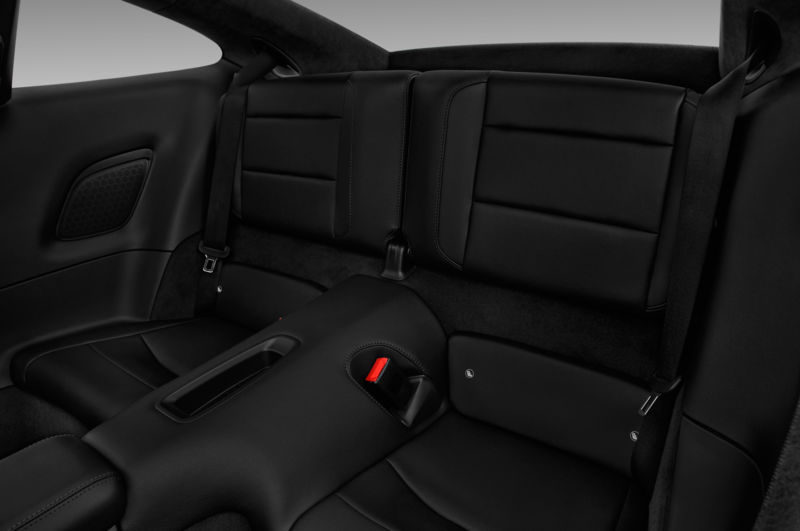 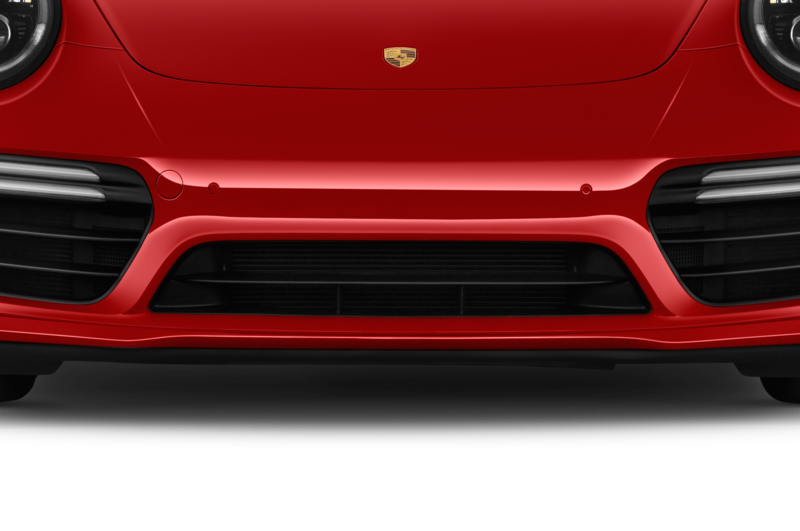 The GT3’s 4.0-liter free-breathing flat-six pushes out 500 hp—a mighty, mighty figure for a naturally aspirated 911. 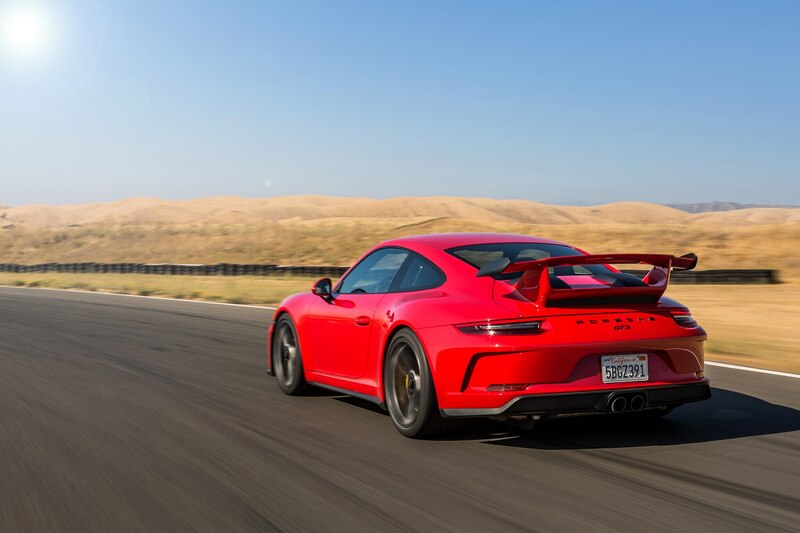 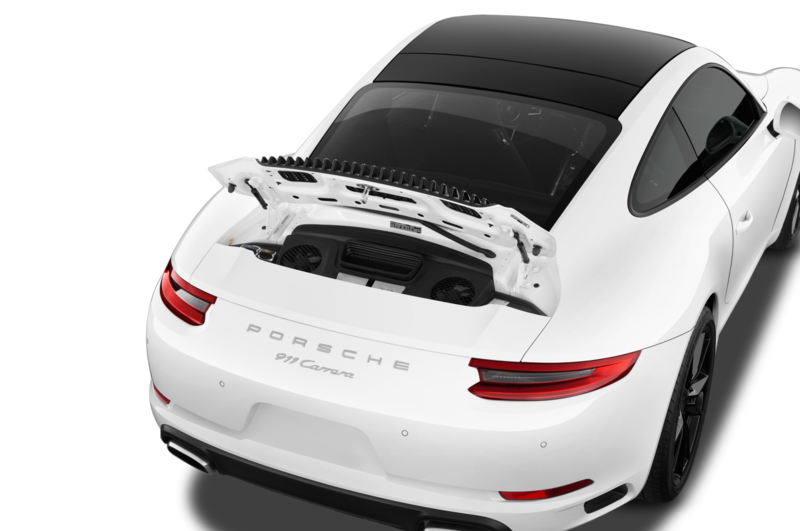 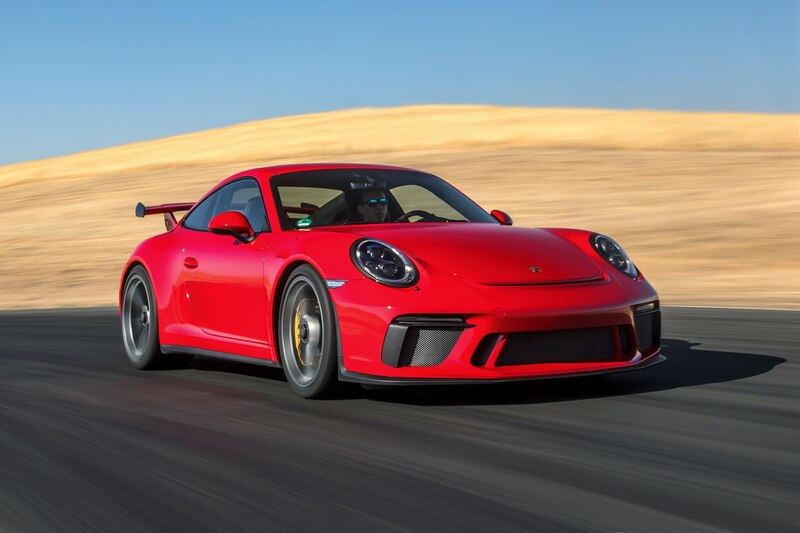 That’s 25 extra horses over the older 3.8-liter engine, which come along with 15 additional lb-ft of torque, for a total of 339 lb-ft. That’s identical to the power figures for both the 911 R and the 991.1 GT3 RS, but the engine is sturdier than ever before. 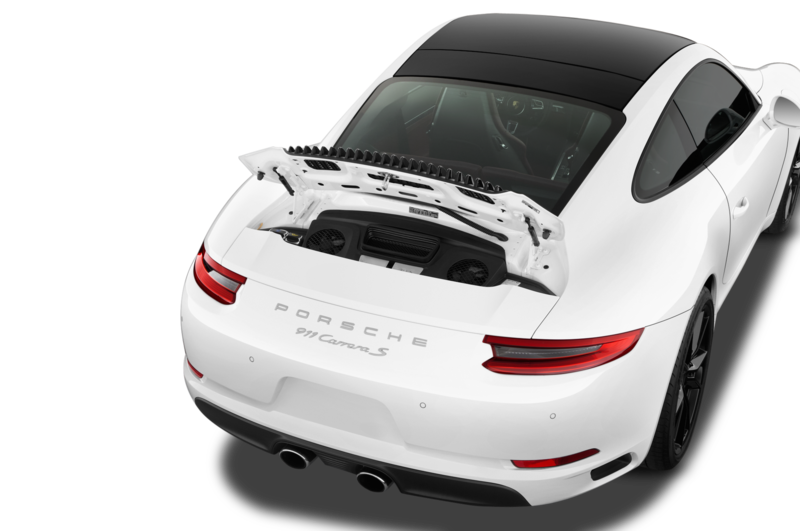 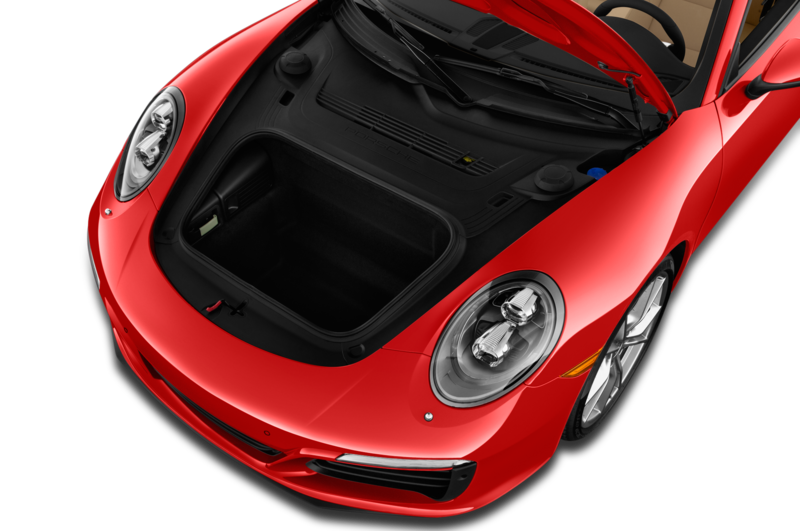 Porsche packed this sixer with all sorts of goodies to ensure it can handle endless pulls to its 9,000 rpm redline with aplomb. 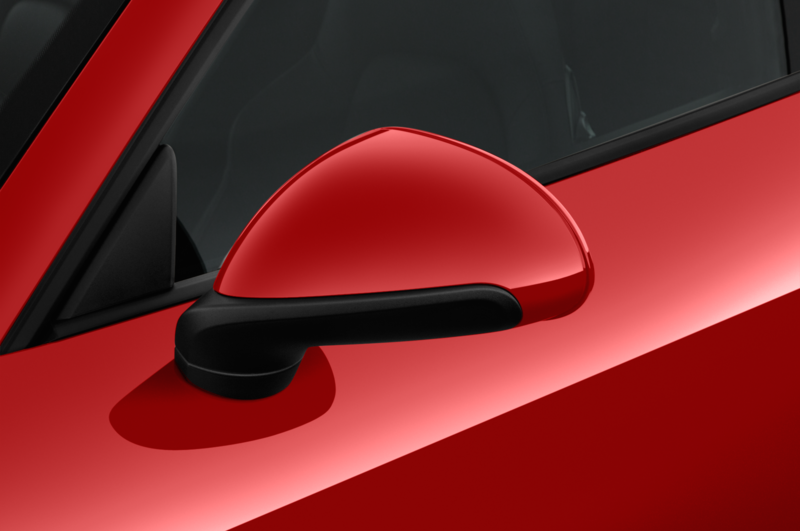 How does it spin so easily? 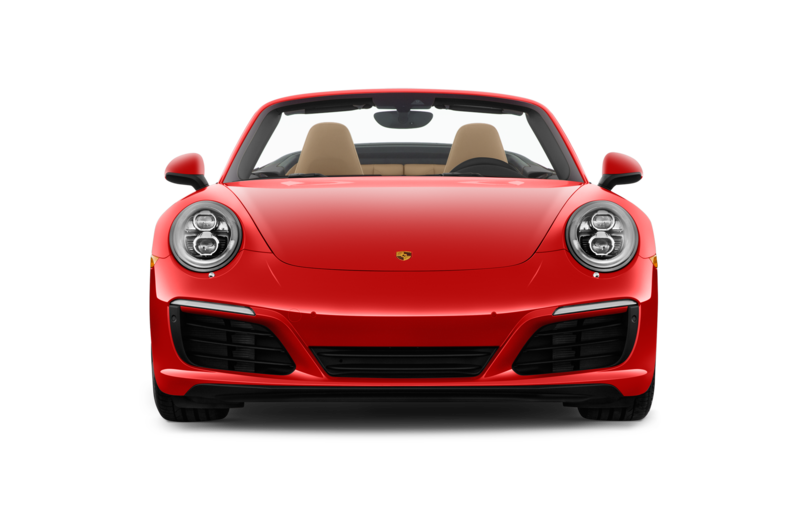 It has a stiffer, hollow, oil-fed crankshaft, shimmed solid lifters, and softer valve springs. 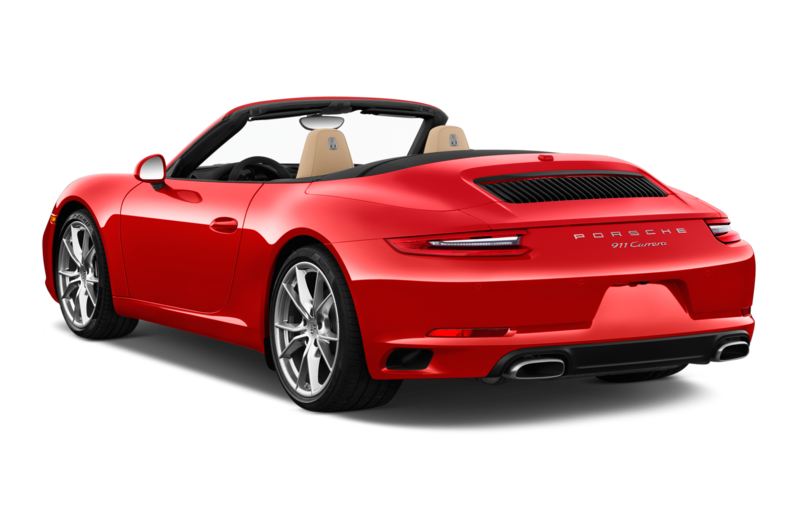 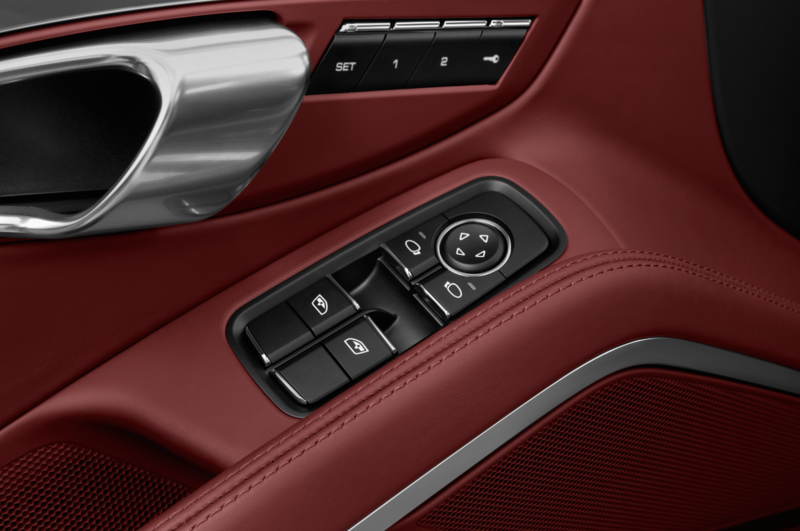 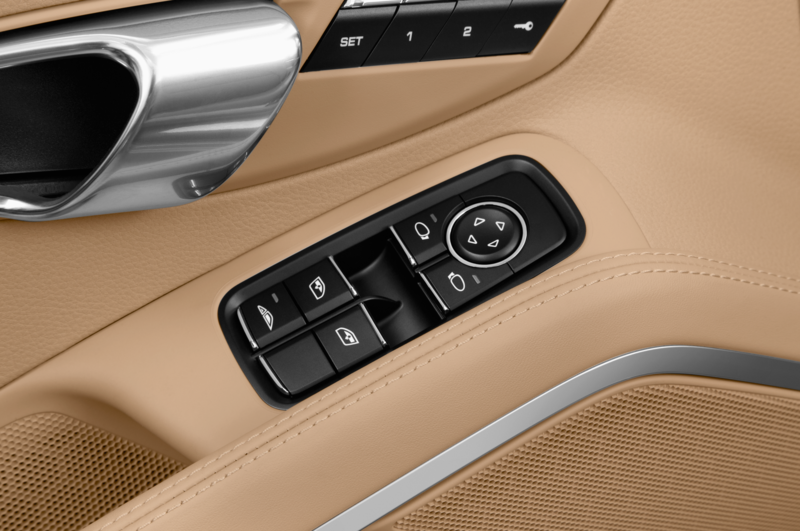 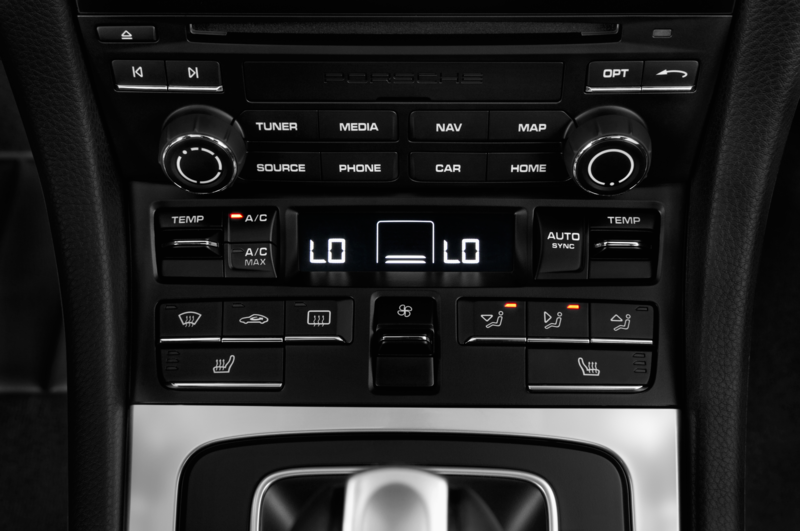 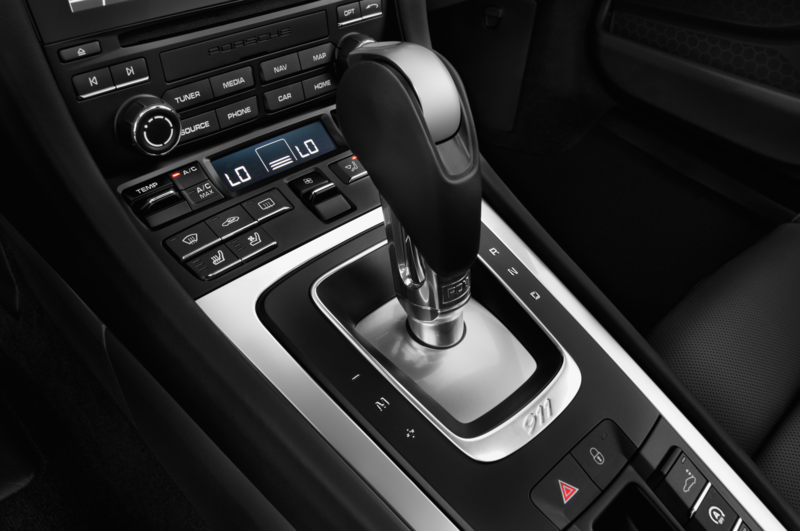 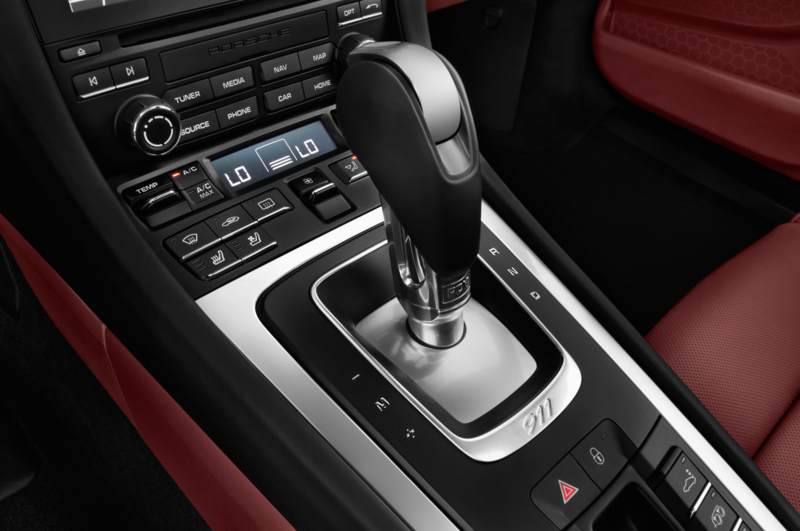 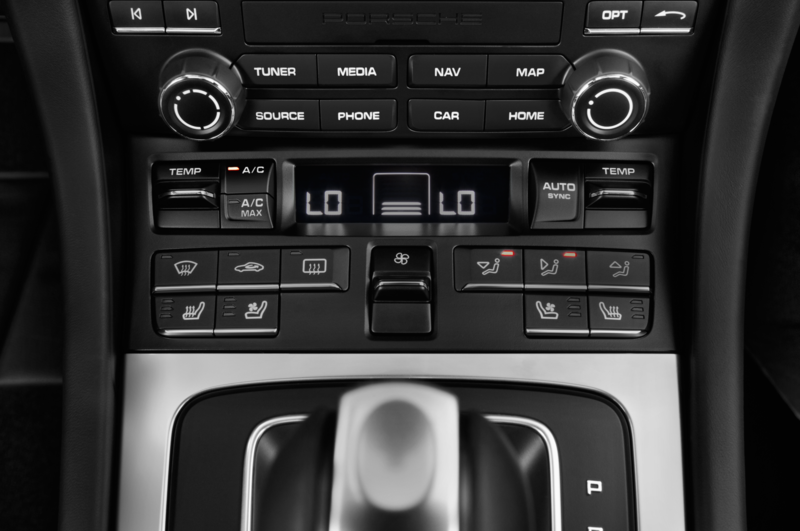 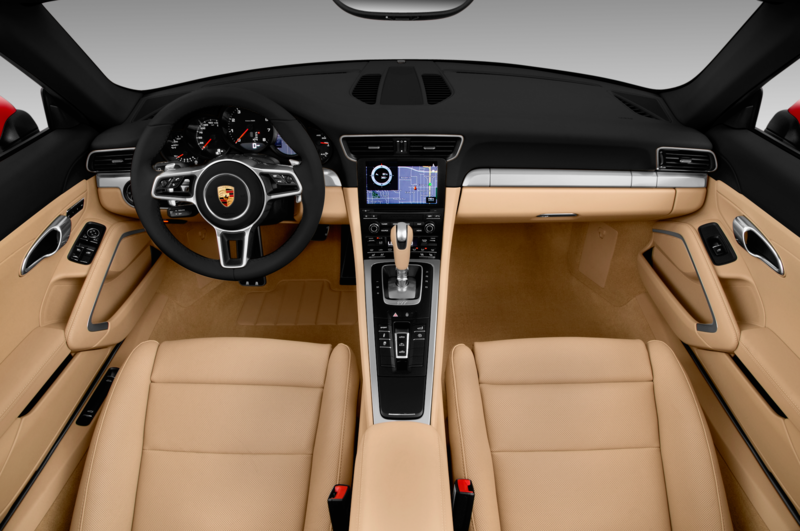 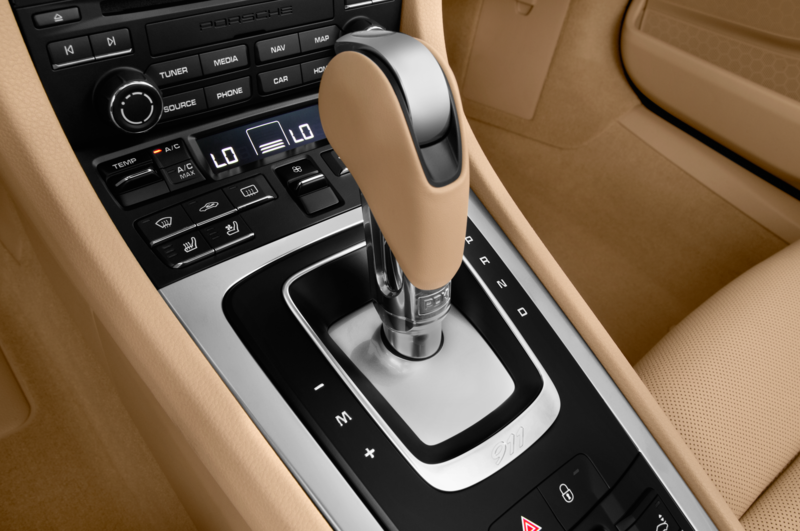 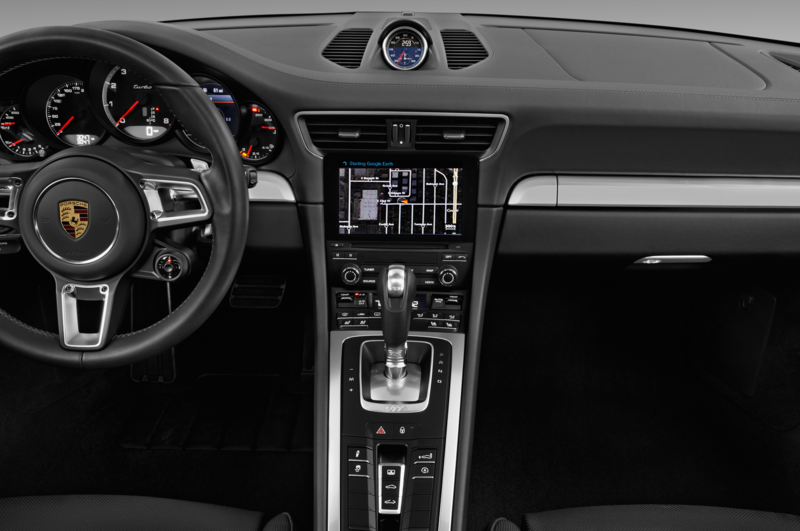 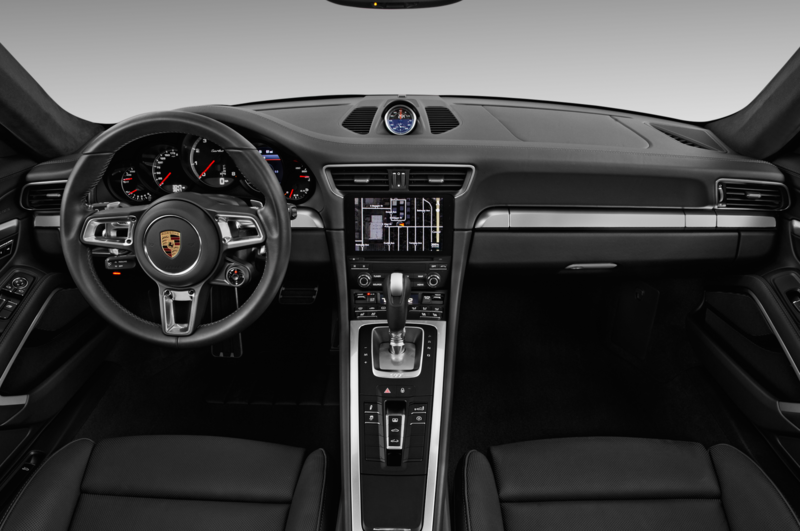 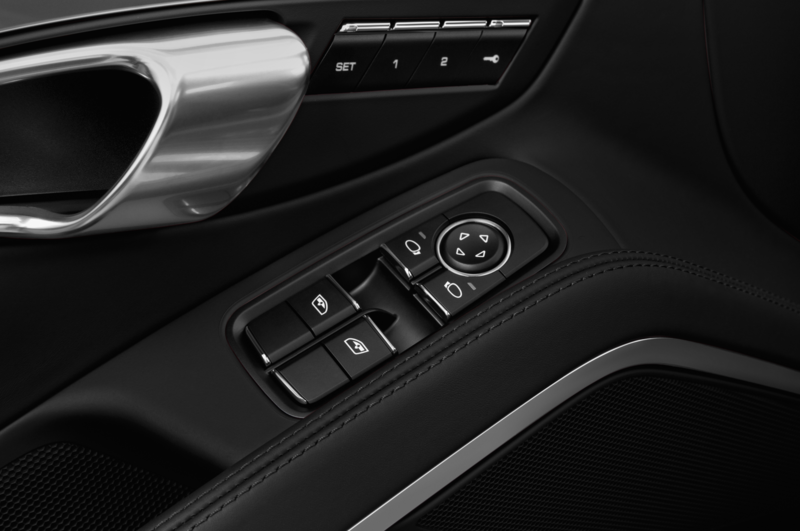 All this high-spun twist is managed by a choice of the six-speed manual transmission or the familiar seven-speed PDK dual clutch box. 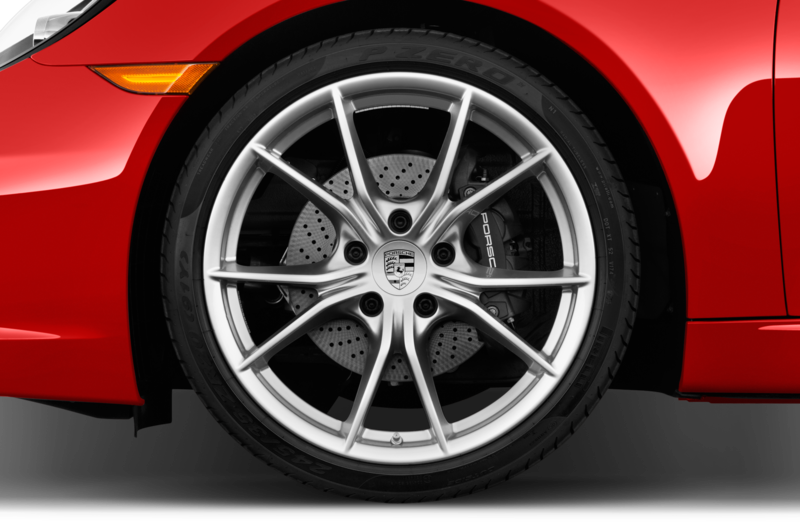 Both power the rear wheels, but how torque is split between the two hubs differs. 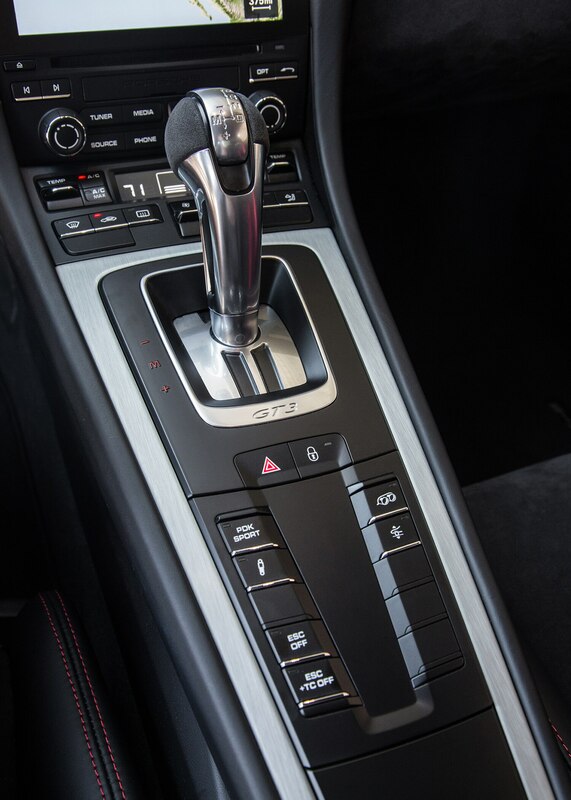 PDK-equipped cars enjoy a super-smart electronic limited slip differential, but for the self-shifting Luddites with the six-speed, the limited slip rear gearset is fully mechanical. 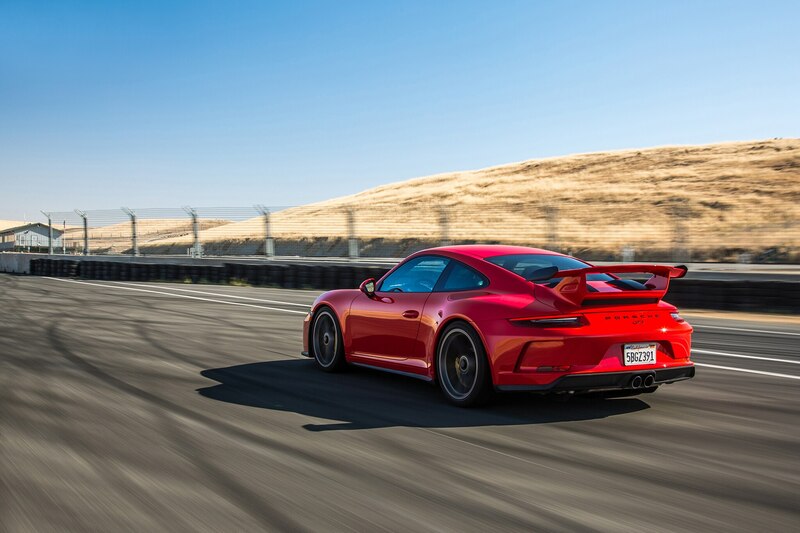 My first taste of the GT3 was out on winding, dusty two-lanes between Napa Valley and Thunderhill Raceway, roughly 120 miles due north of our overnight stay. 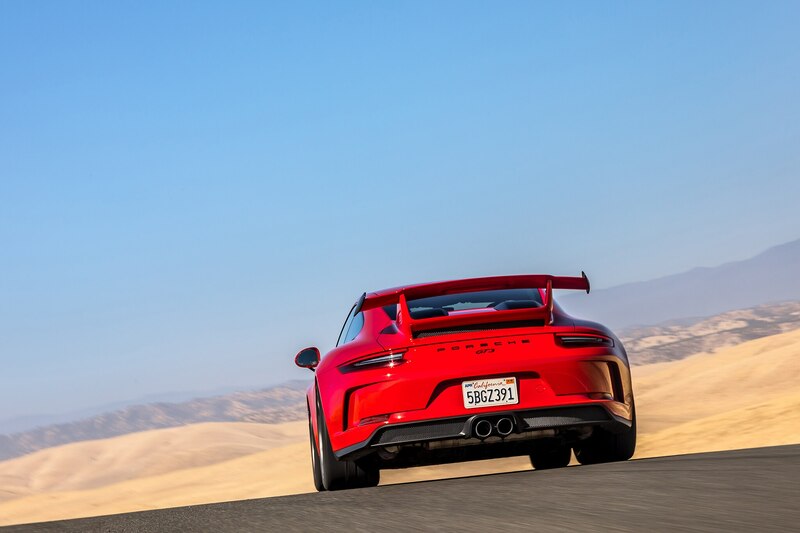 The 991 is not a small car, but even cutting through the narrow forest hills en route to the track, the tight and hyper-responsive character of the GT3 shrunk the car around my shoulders. 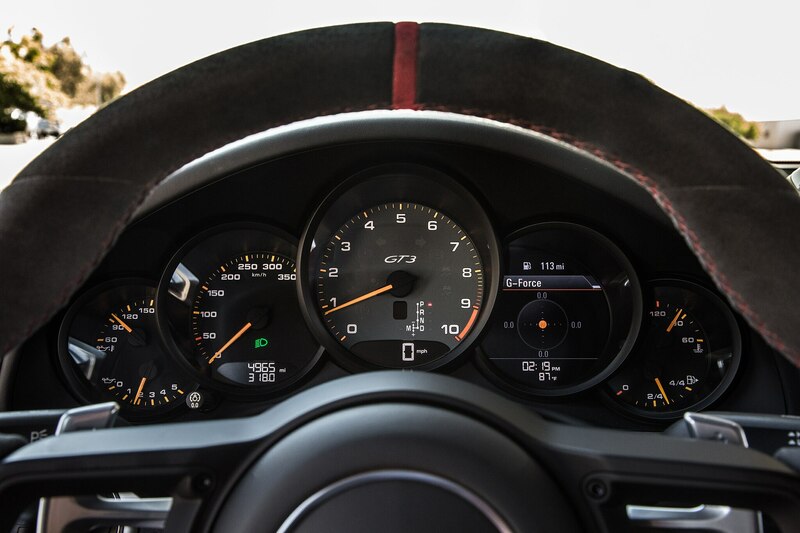 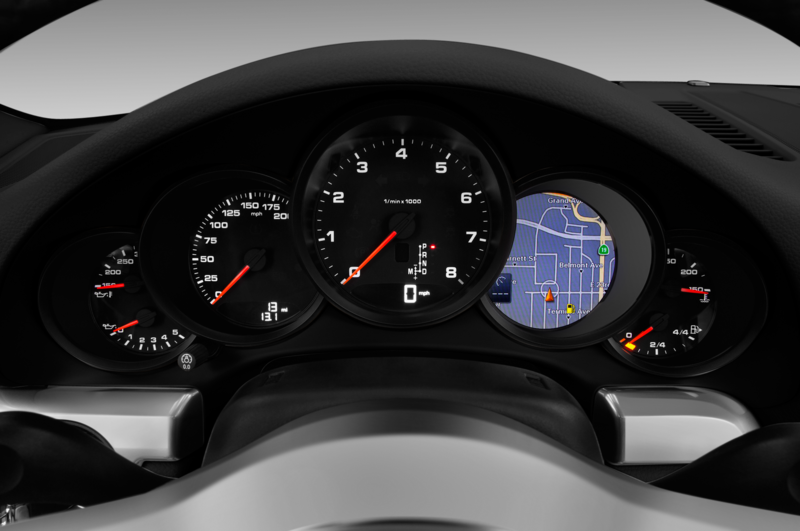 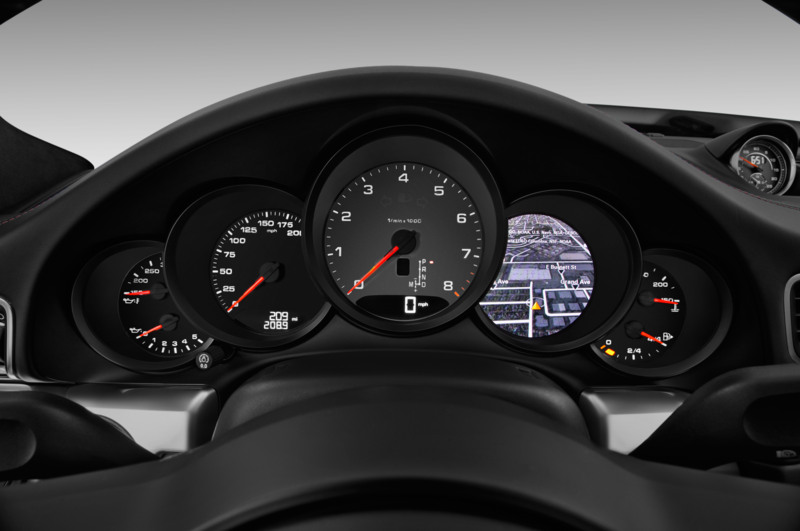 Once I ran out of traffic and corners, I explored the full range of the 9,000 rpm tachometer. 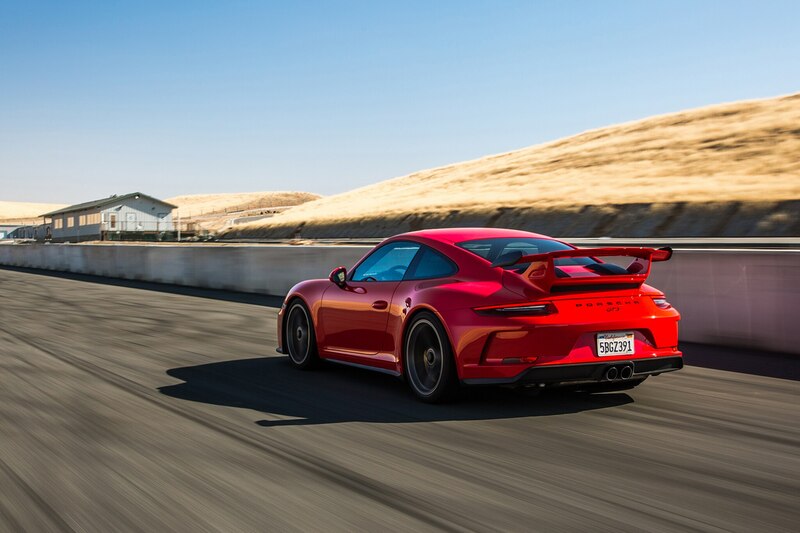 Moreso than even the gnarliest V-8s from Detroit and the screaming V-12s from Italy, the current batch of Porsche 4.0s have a violent, primal wail chock full of mechanical thrash and metallic zing that turns the skin electric. 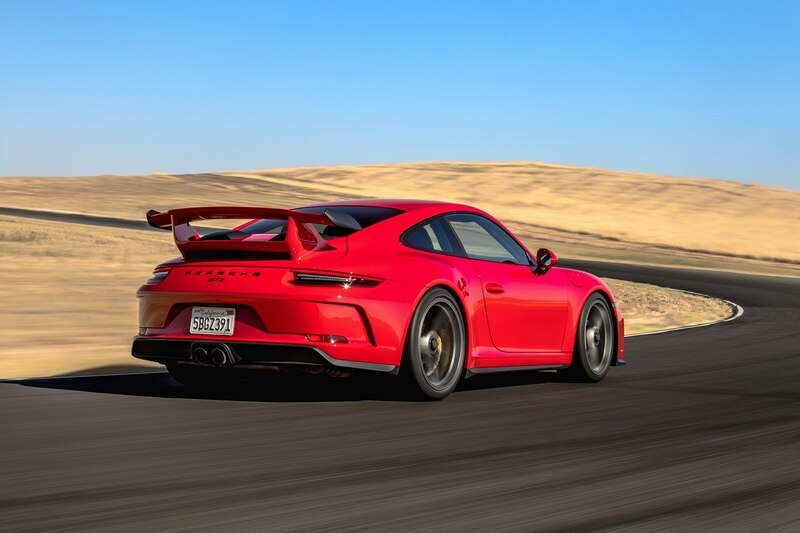 Almost as intoxicating as the sound is the speed. 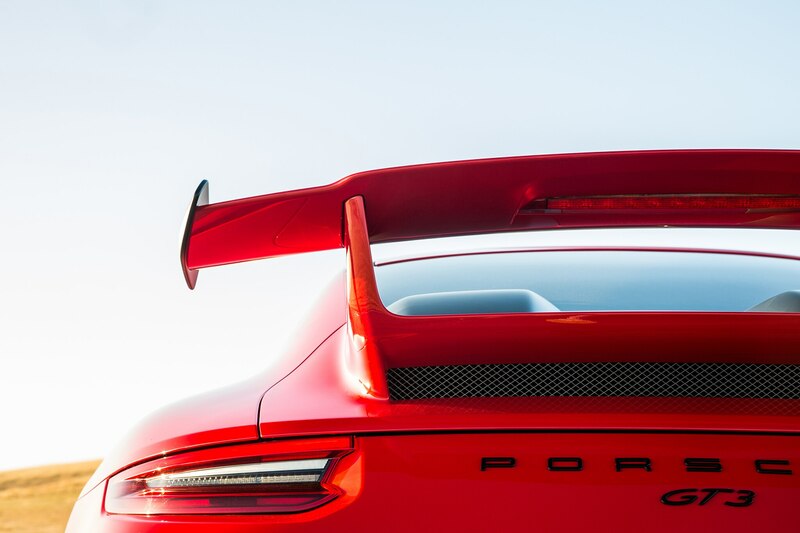 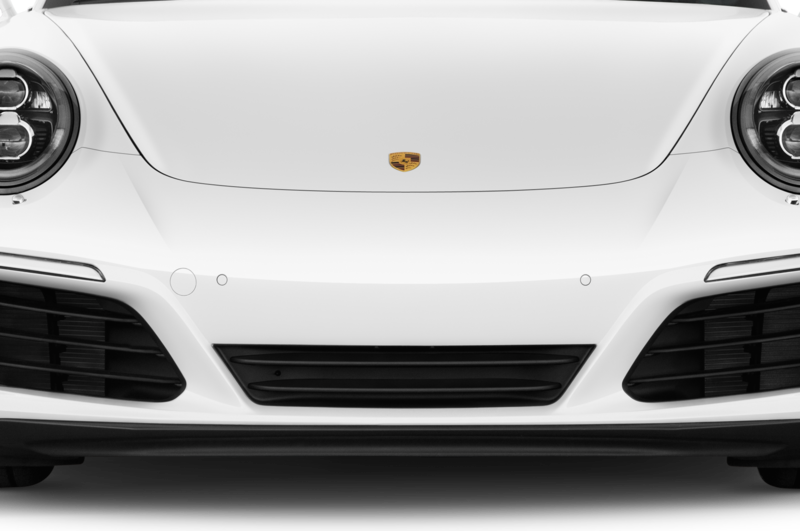 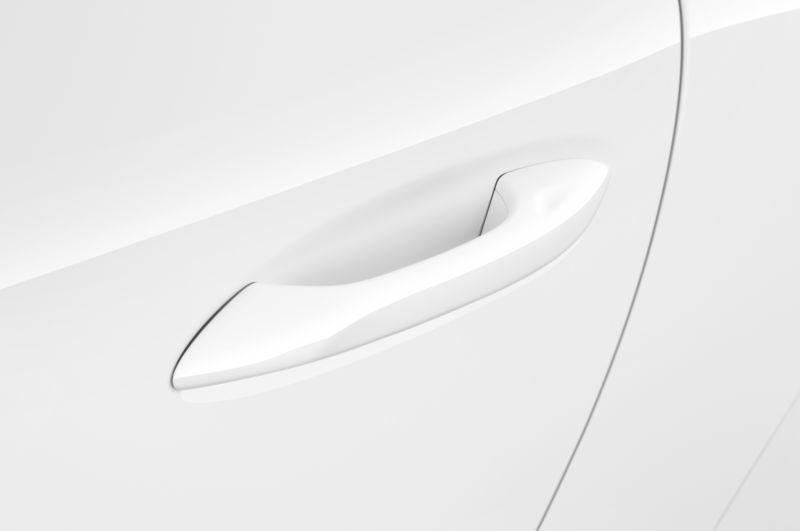 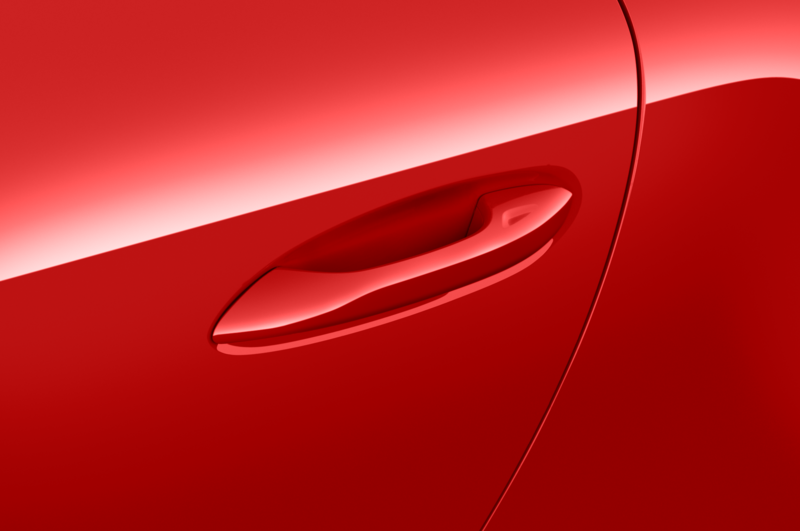 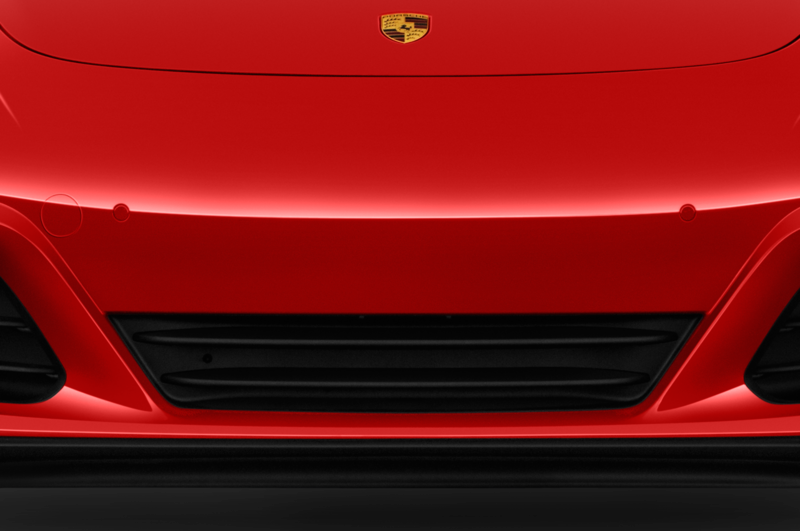 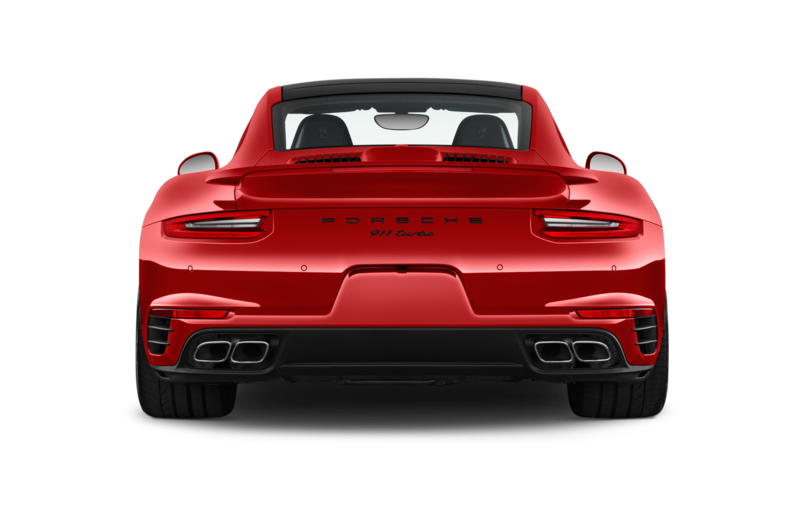 In the PDK, 0-60 mph is dispatched in just 3.2 seconds, 0-100 mph in 7.3, and top speed is 197 mph. 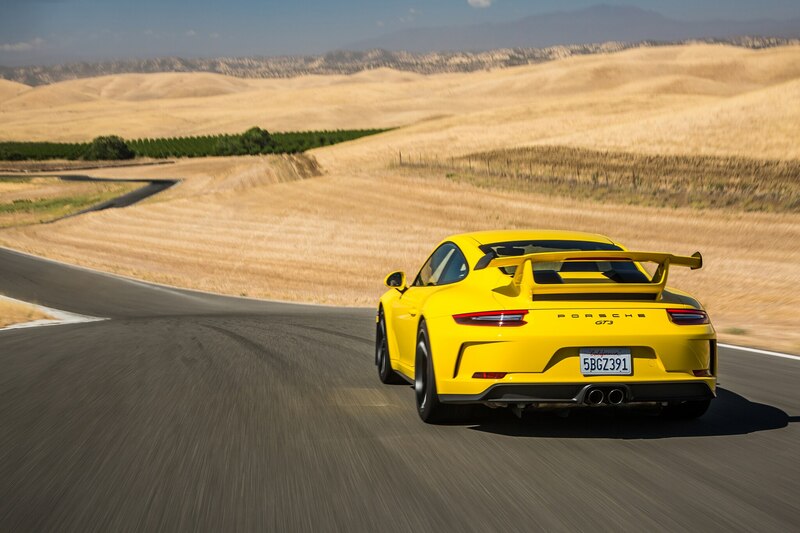 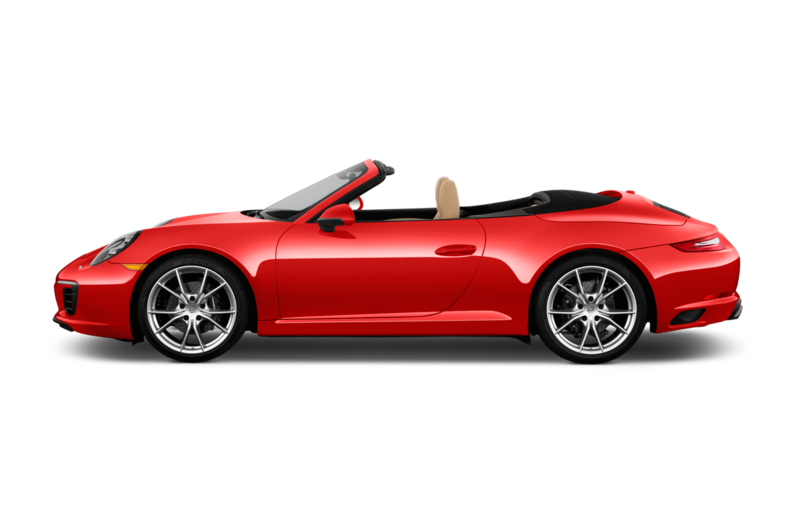 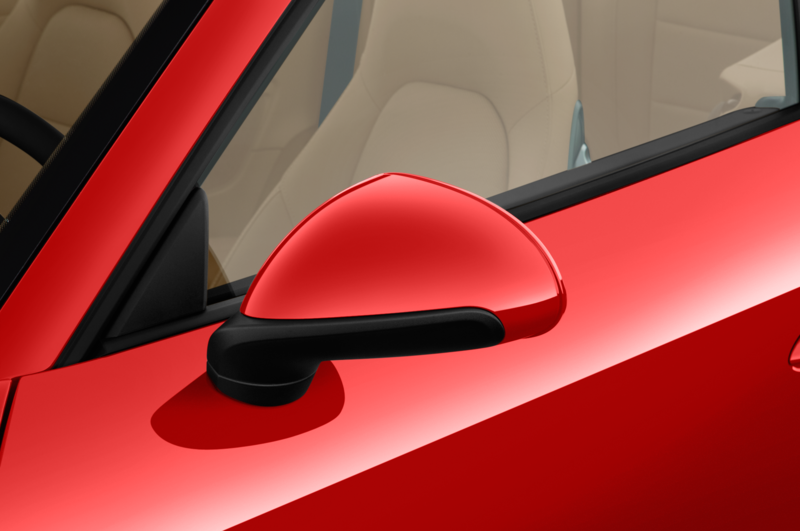 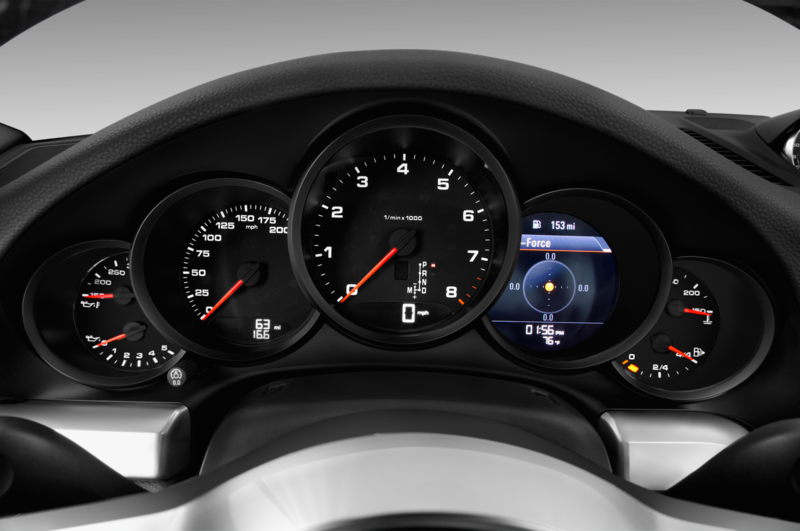 In the manual, those figures jump to 3.8 seconds for 60 mph, 7.6 for 100 mph, and 198 mph for the top speed. 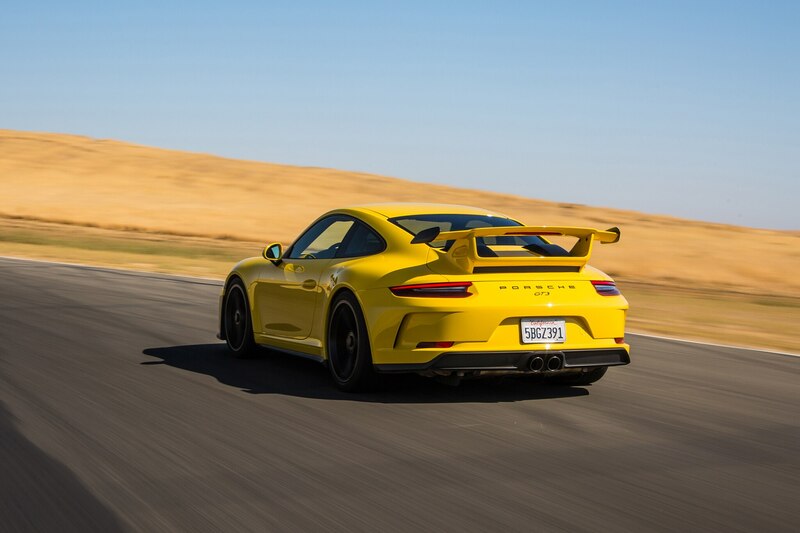 Passing was nearly as violent as the 911 Turbo I drove earlier this year, but for different reasons. 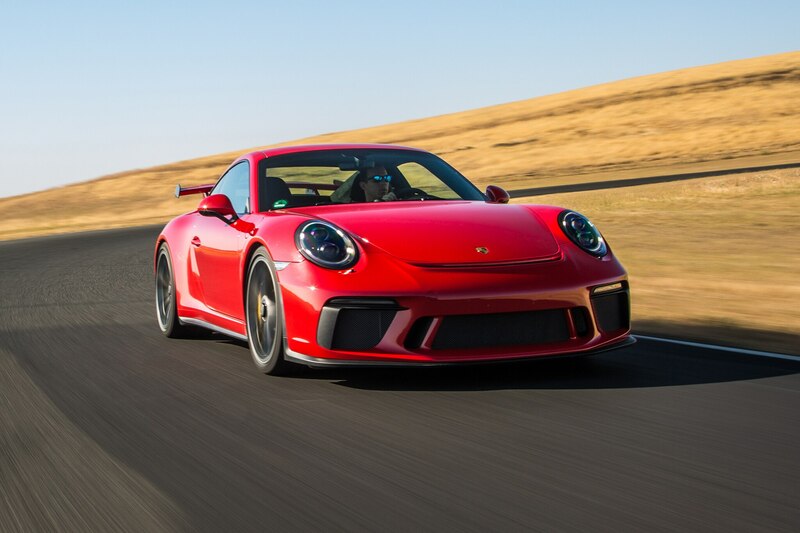 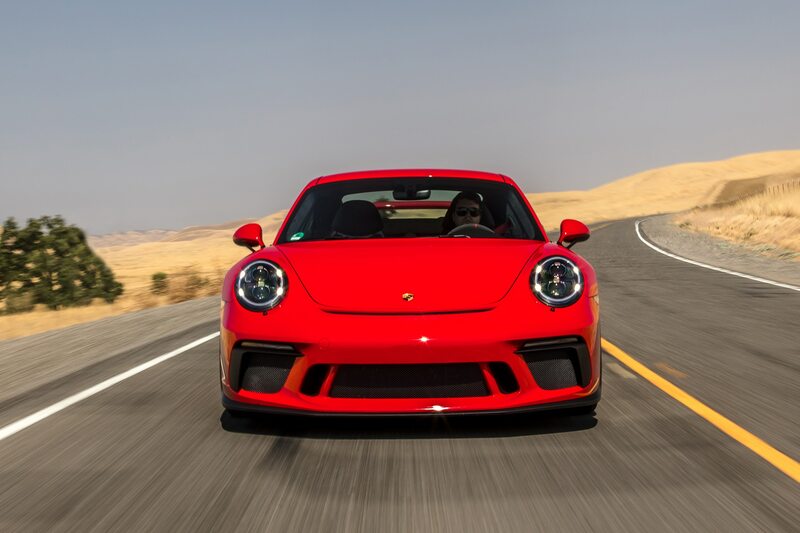 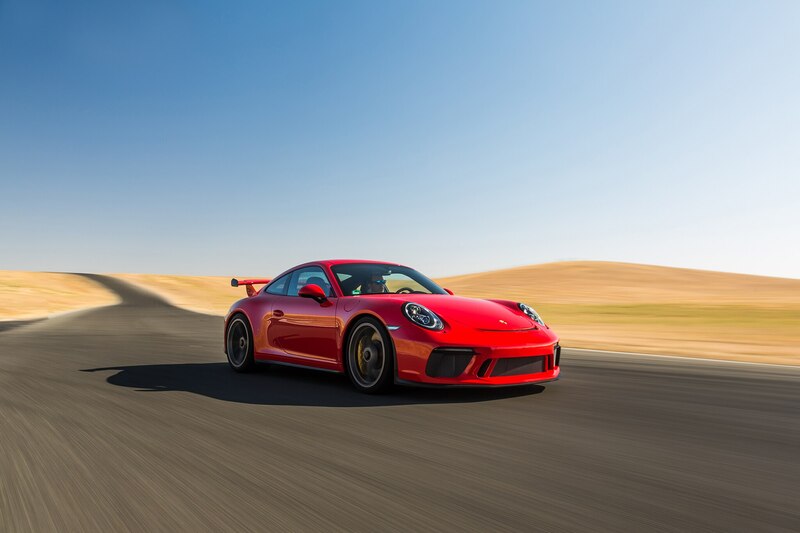 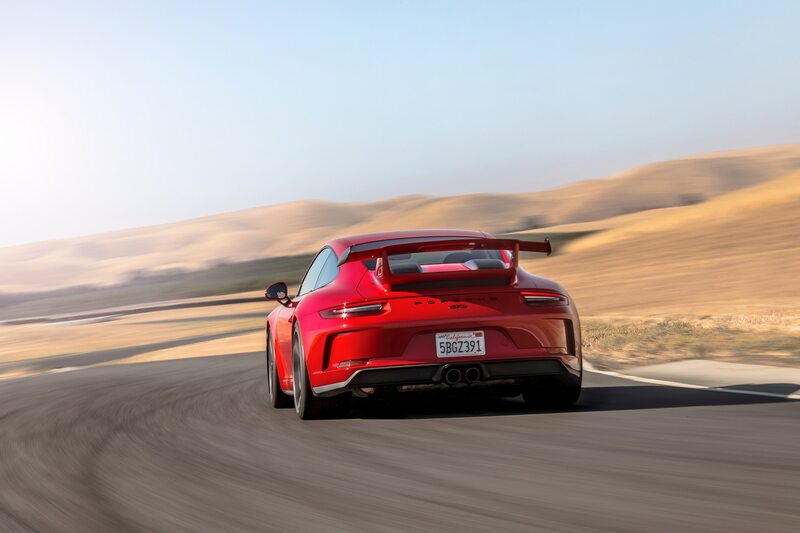 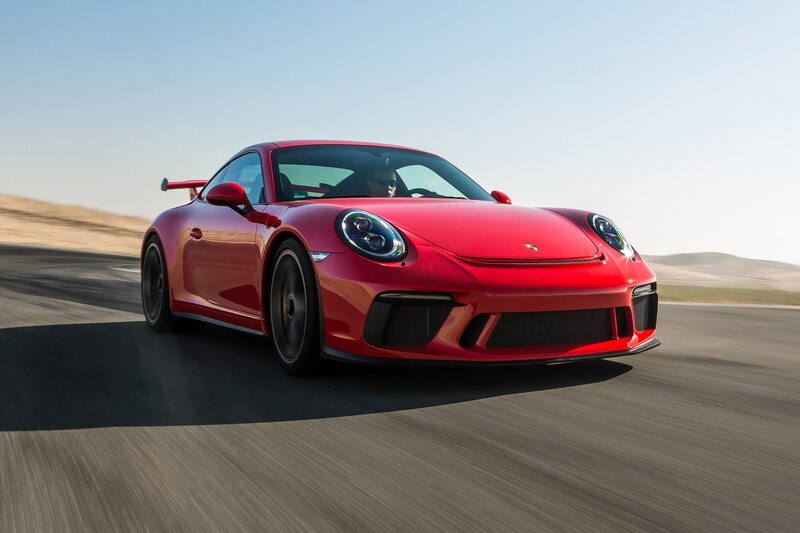 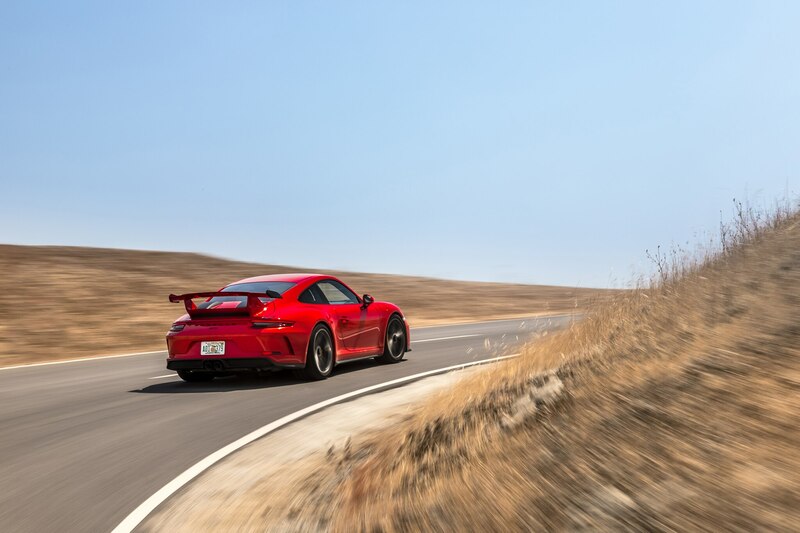 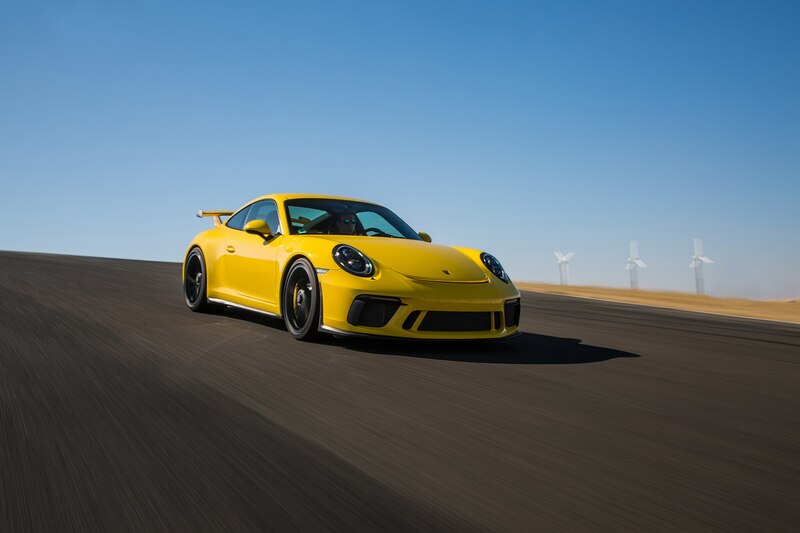 The Turbo blinks in and out of warp with an effortless, even friendly whoosh—make a quick, smooth pass in the GT3 and you’re liable to scare the daylights out of the occupants of the rolling chicane with the resulting howl as the PDK kicks down two gears. 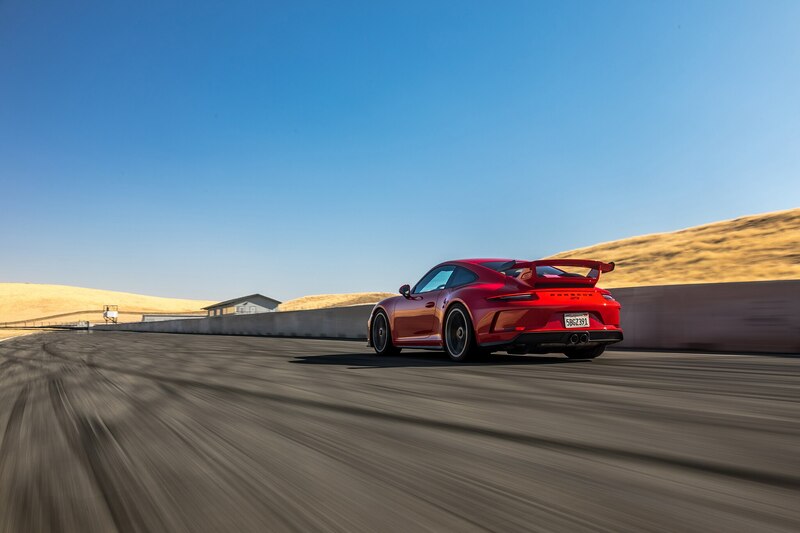 Tremendous car, meet tremendous track. 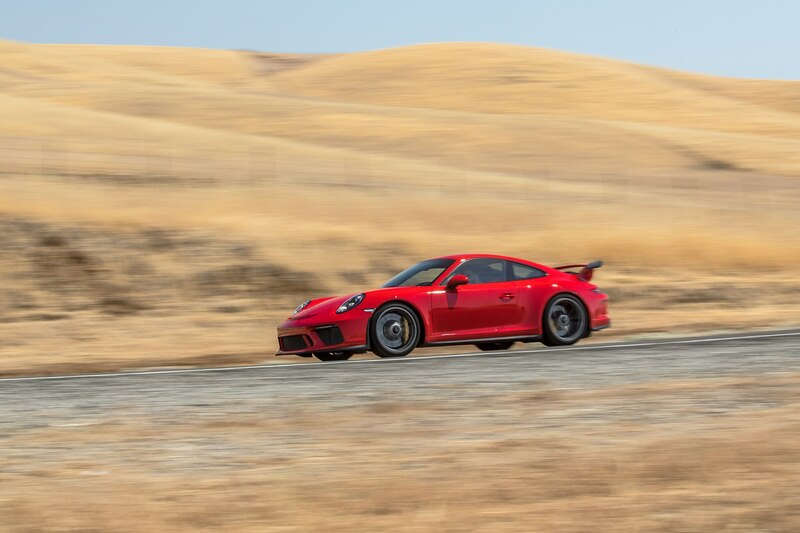 Thunderhill was mine for the day and Porsche made sure I got its money’s worth. 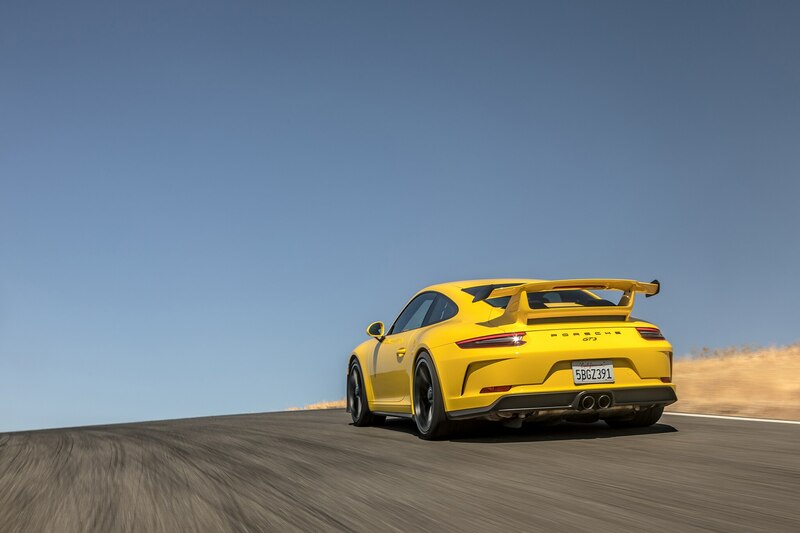 This was the five-mile configuration of the track, infamously billed as the longest road course in America. 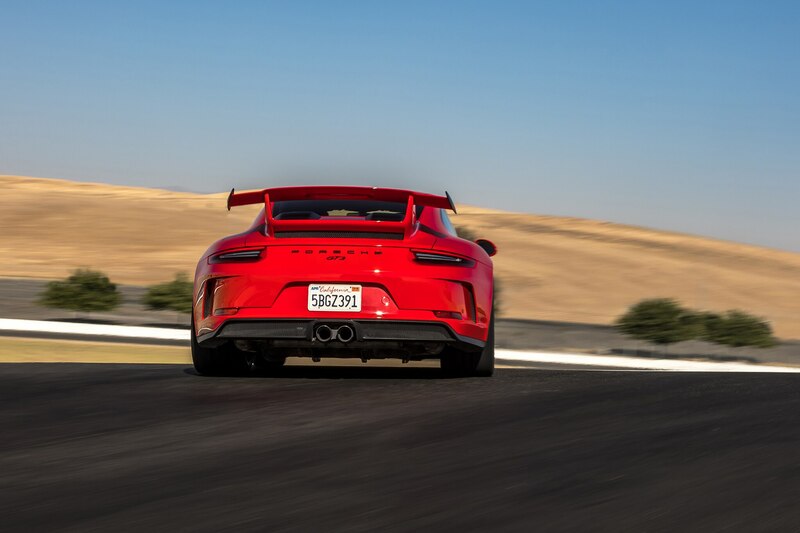 It’s not just the distance that fatigues—Thunderhill is littered with off-camber sweepers, blind crests, and decreasing-radius corners that impress and intimidate. 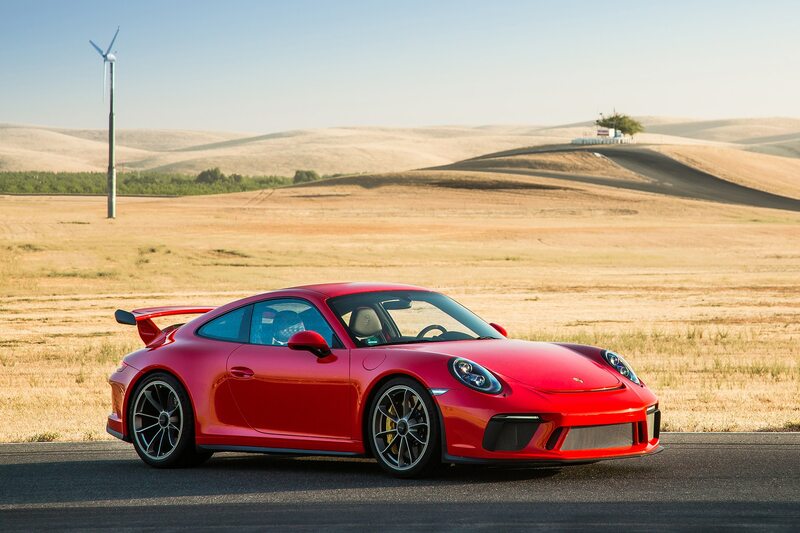 All three of the GT3s on hand were flown in from Germany, so to ensure its precious metal was returned to sender sans scuff or smudge, Le Mans champion and endurance legend Hurley Haywood and current factory Porsche driver Patrick Long were rolled out of storage to play safari guide for the day. 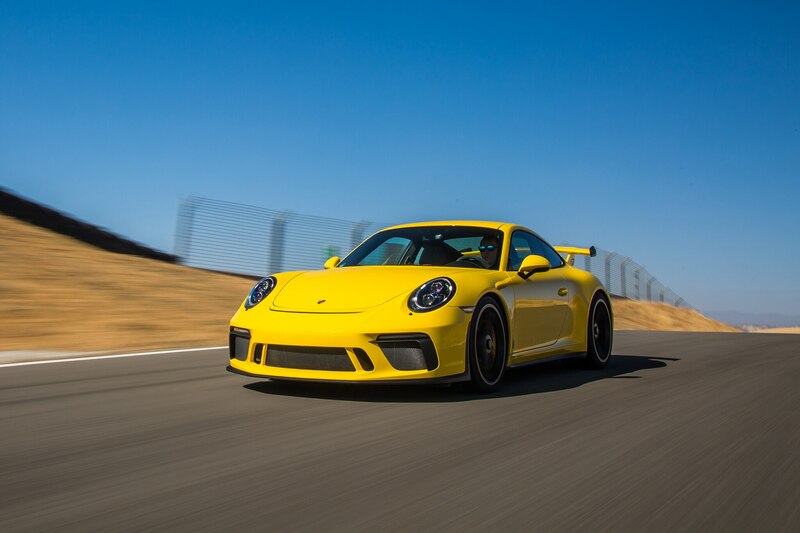 After a quick driver’s meeting, we slotted ourselves into the GT3s thrumming in pit lane, lined up behind either Long’s white 991.2 GTS or Haywood’s blue Turbo S. I cut my Thunderhill teeth in a red PDK GT3, carefully probing the track under the speed allowed by Haywood until we exploded into full-throttle down the main straight that led to the end of the first lap. 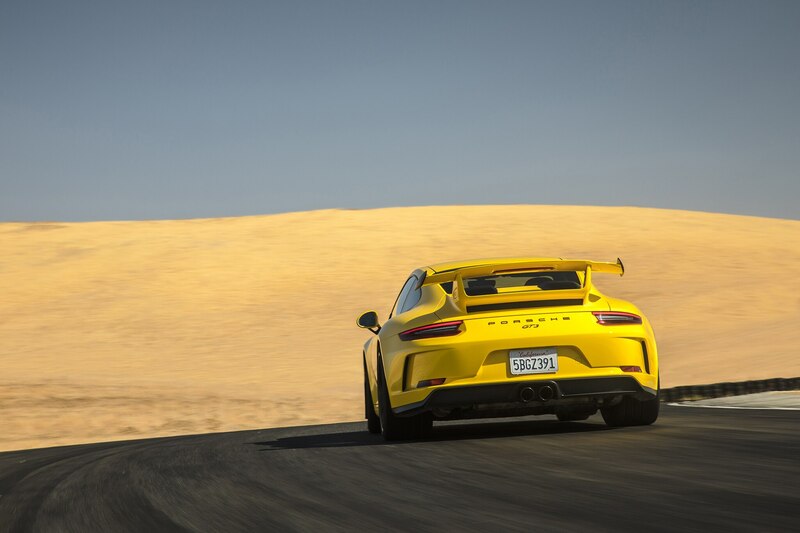 Out among the straw-colored hills of the raceway park, the GT3 was magic. 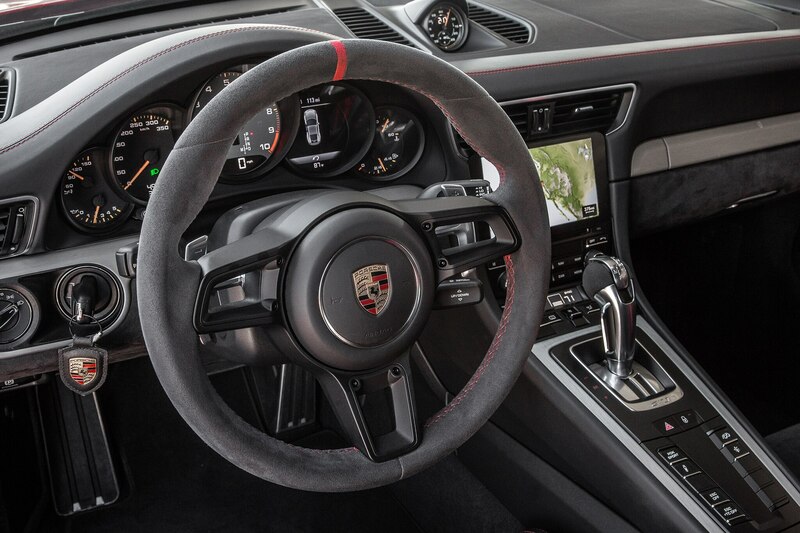 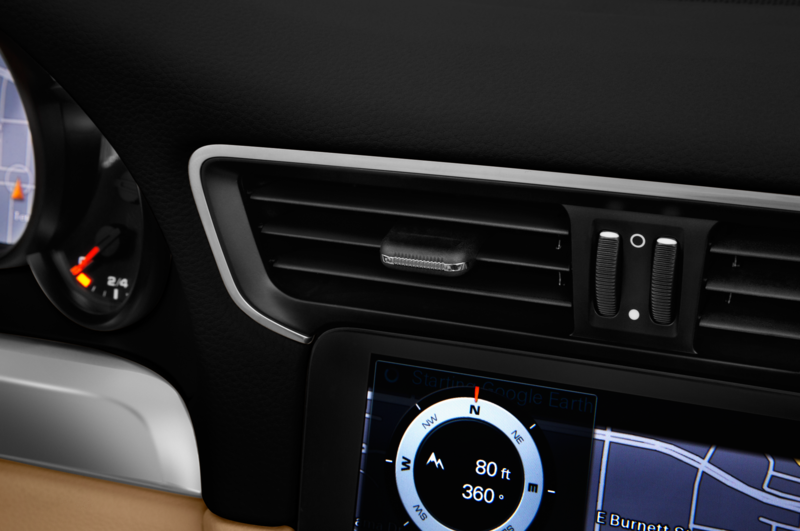 Every input, from the throttle, steering, braking, clutch, and shifter felt measured, perfectly weighted. 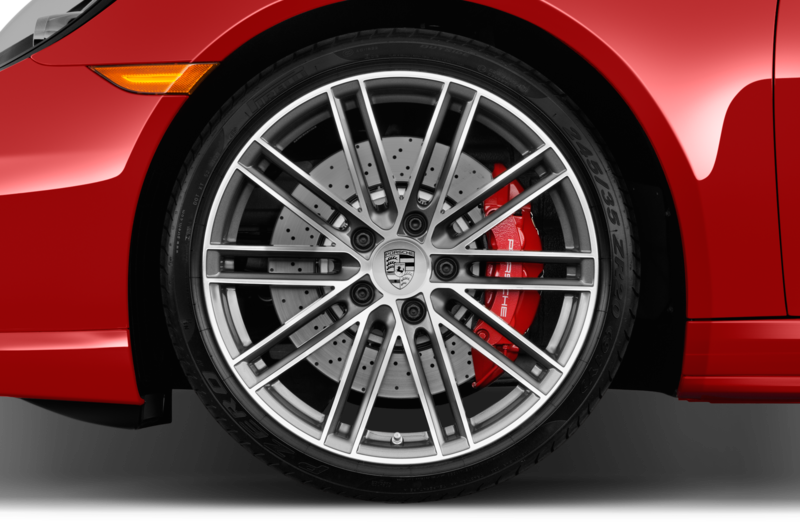 The off-camber turns were vicious, but so was the steering, enhanced by the rear-wheel steering system that debuted on the last generation. 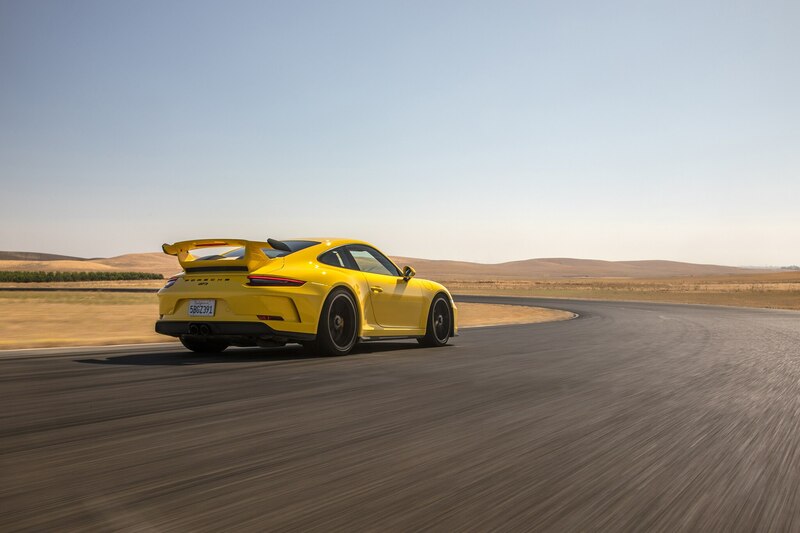 In the PDK, these challenging corners were putty under our fingertips. 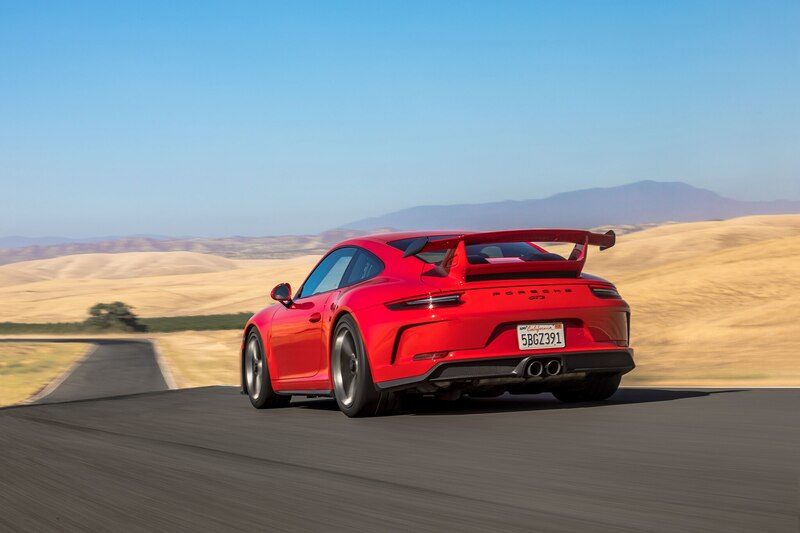 Smash the optional carbon ceramic brakes, turn in, gas it, let the e-diff grab the rear end by the scruff, and lean on the aero as you whip around that decreasing radius with hair-ripping grip. 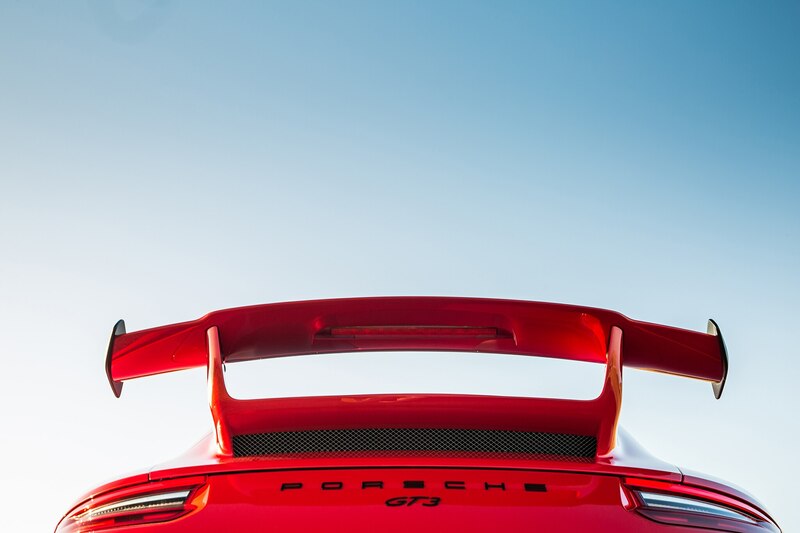 Exit, and breathe. 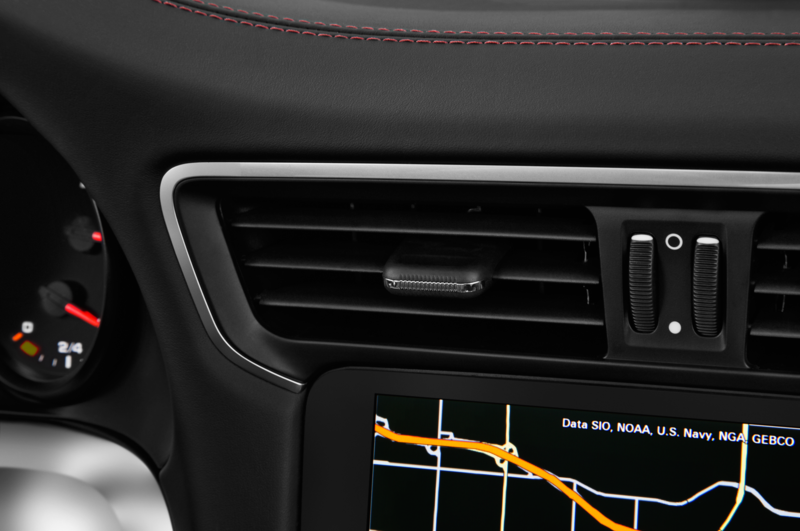 Pin it as close to 9,000 as you can, and repeat. 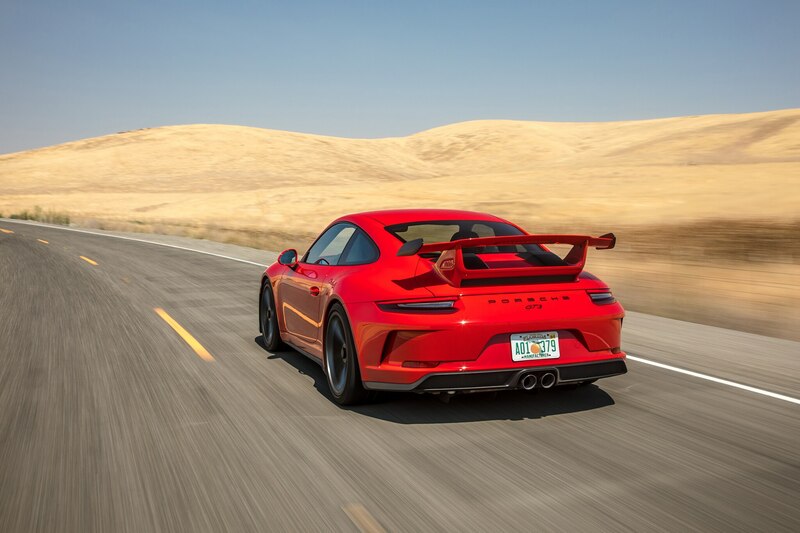 The manual GT3 was different. 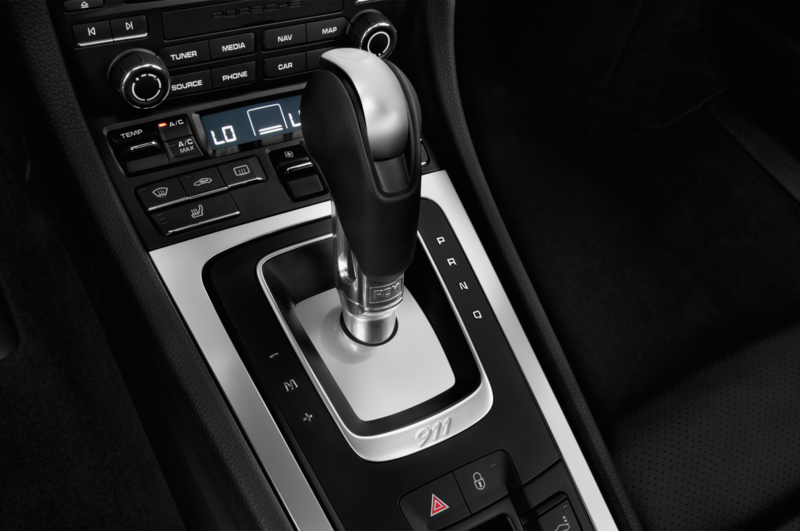 It wasn’t so much the additional effort of the three-pedal dance, but the mechanical differential out back that changed the game. 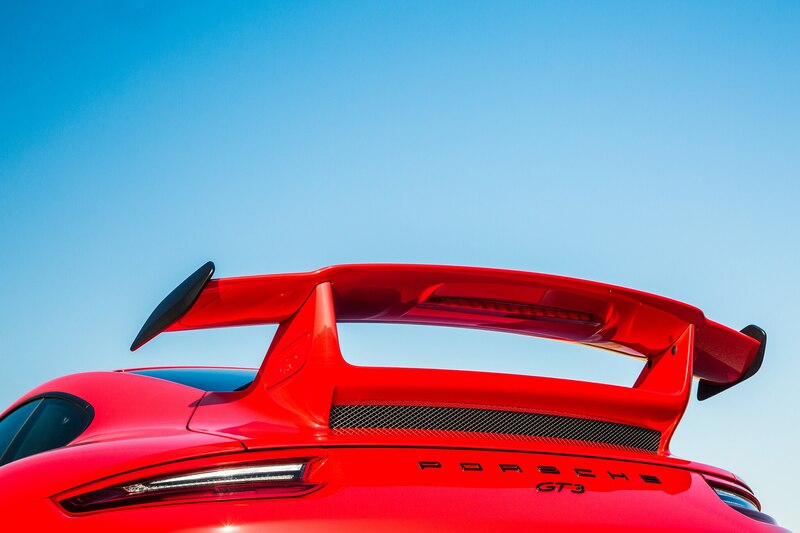 Where the PDK absorbed and muffled sloppy cornering and throttle use, the manual gave my mistakes a megaphone. 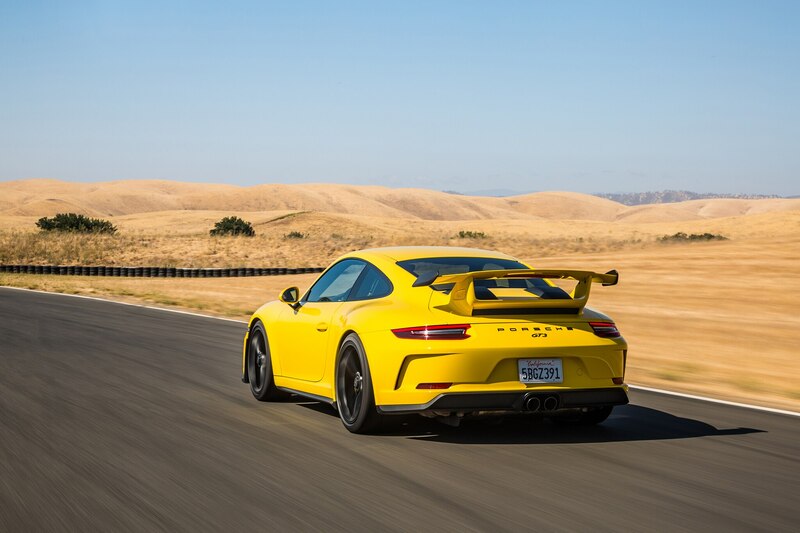 Per instruction and my own volition, all traction control and stability systems were left on, but the yellow six-speed GT3 still enjoyed a gentler touch. 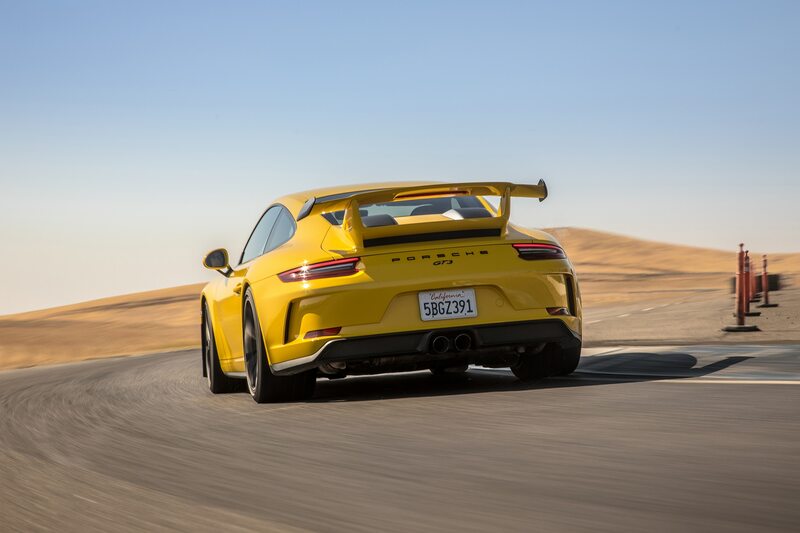 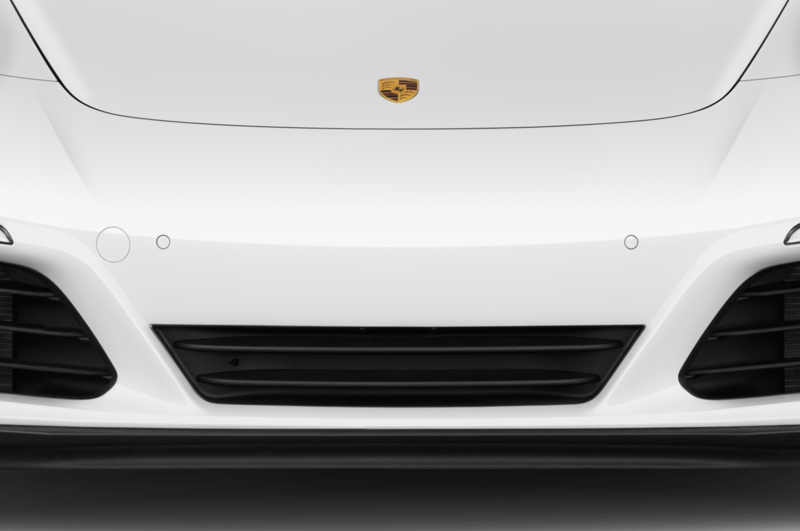 The aero and ceramic stompers were still there, as was Porsche’s excellent torque vectoring system (PTV), but the rear end was much more playful, especially on corner exit. 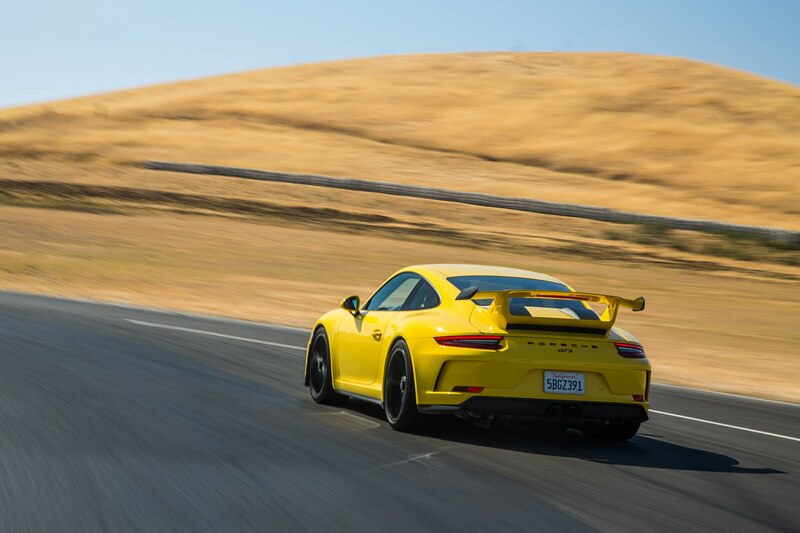 After a full day, we pointed our GT3s back toward Napa. 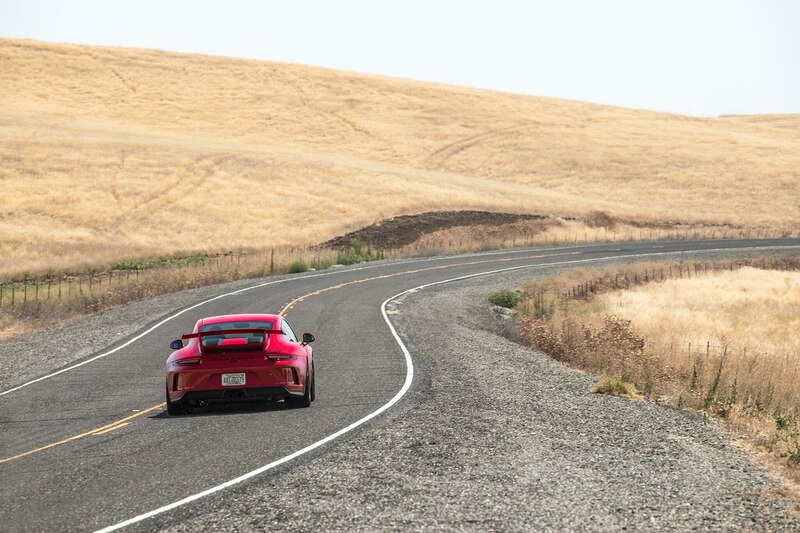 I was back in the manual GT3 for the three hour drive back, enjoying the scenic wine country scenery surrounding the nearly abandoned hill passes. 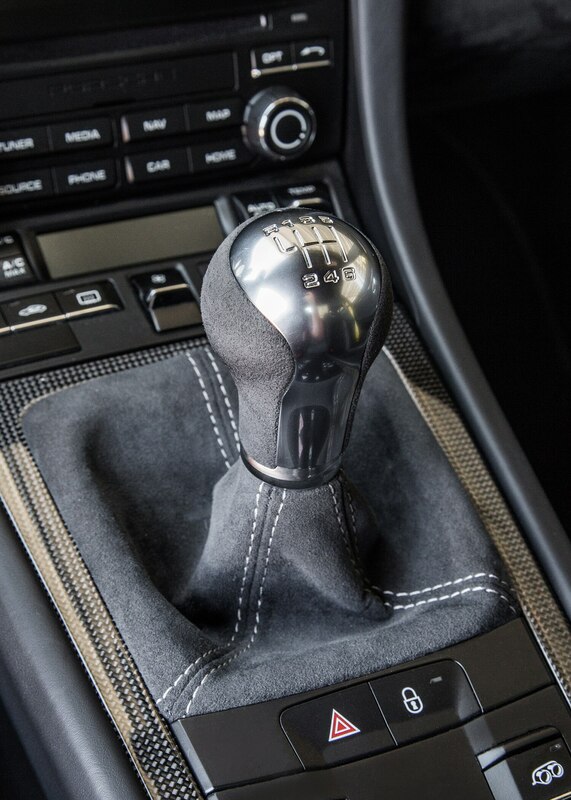 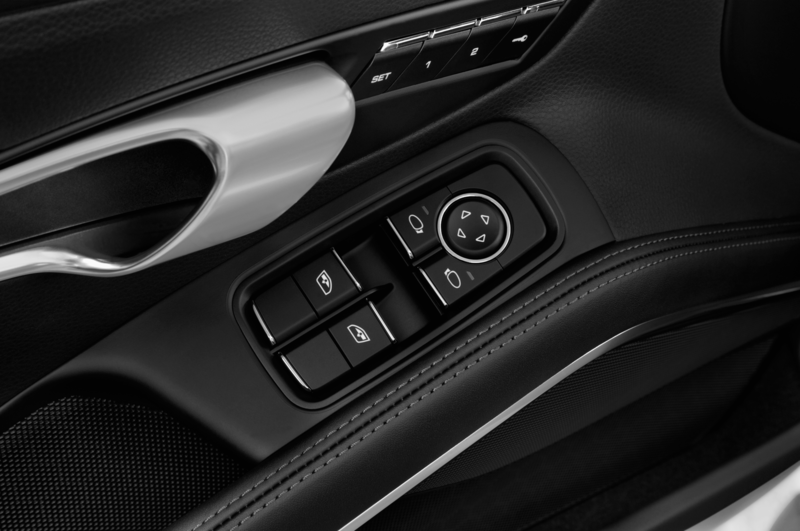 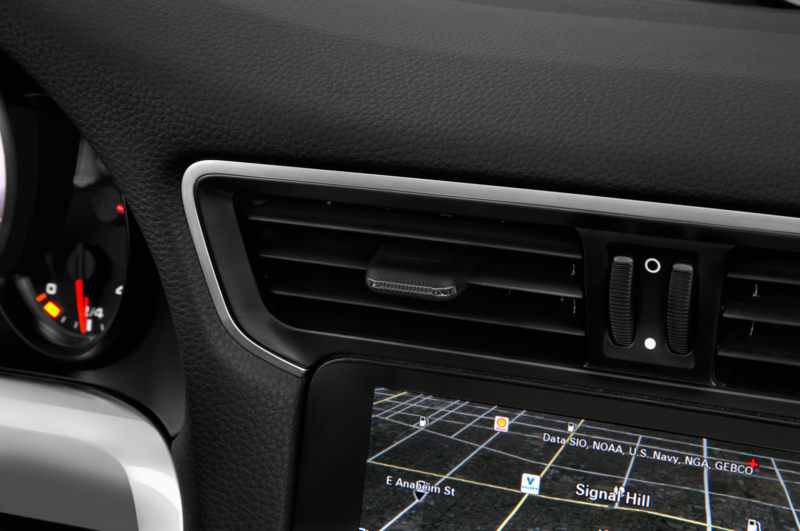 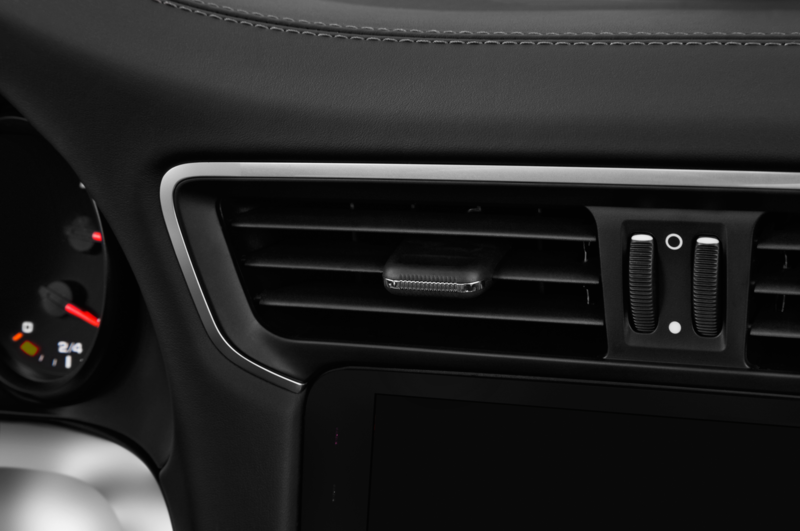 After a few turns, the choice of transmissions is clear—for street use, grab the manual. 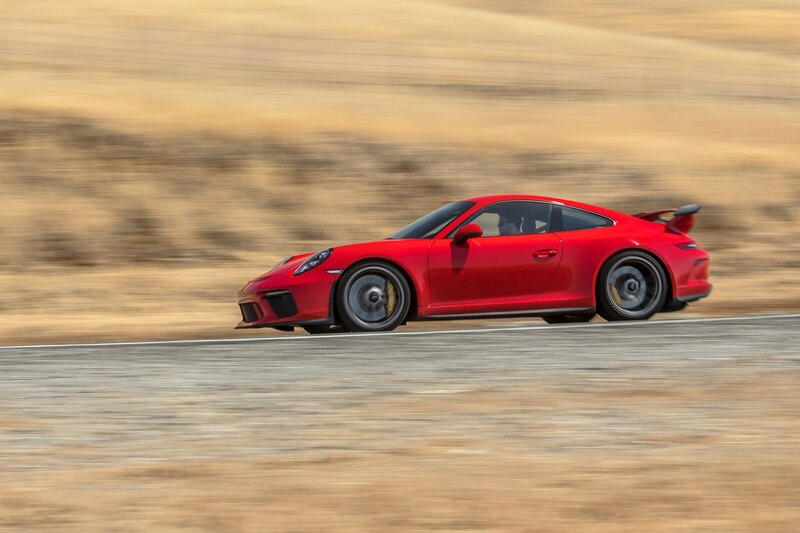 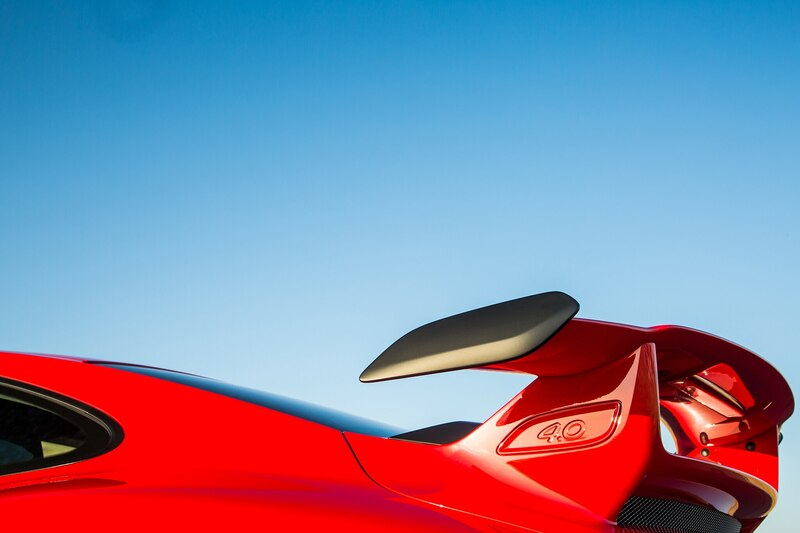 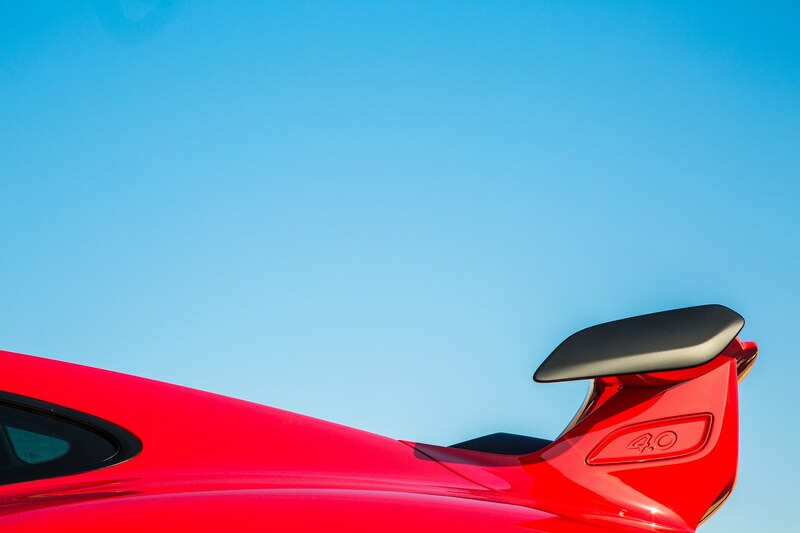 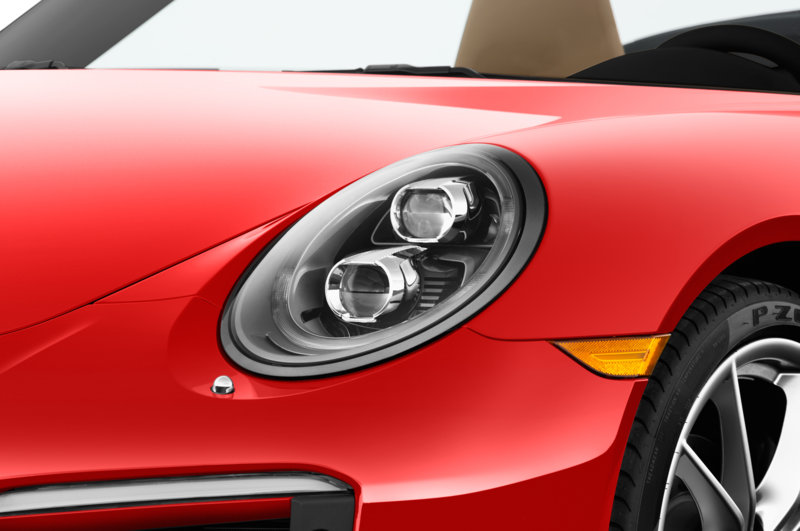 It’s more enjoyable, nearly as fast, and for a 500-hp weapon, is eminently approachable for canyon or highway blasts. 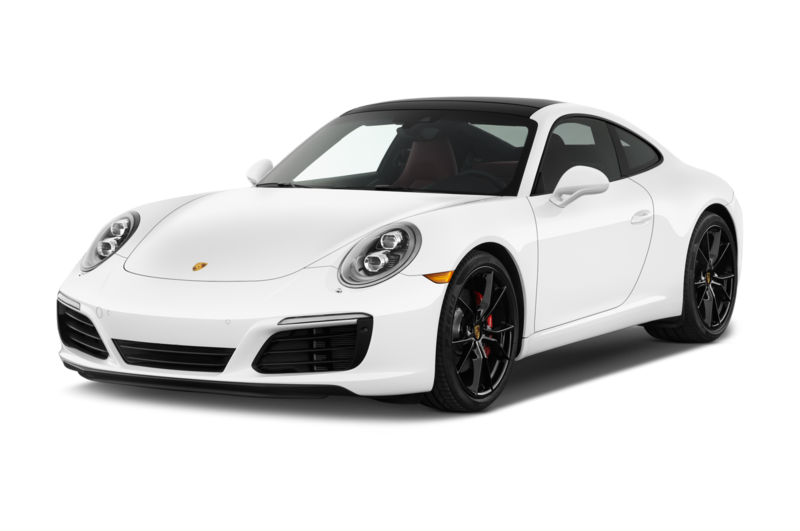 In the market for a lightly used 911 R? 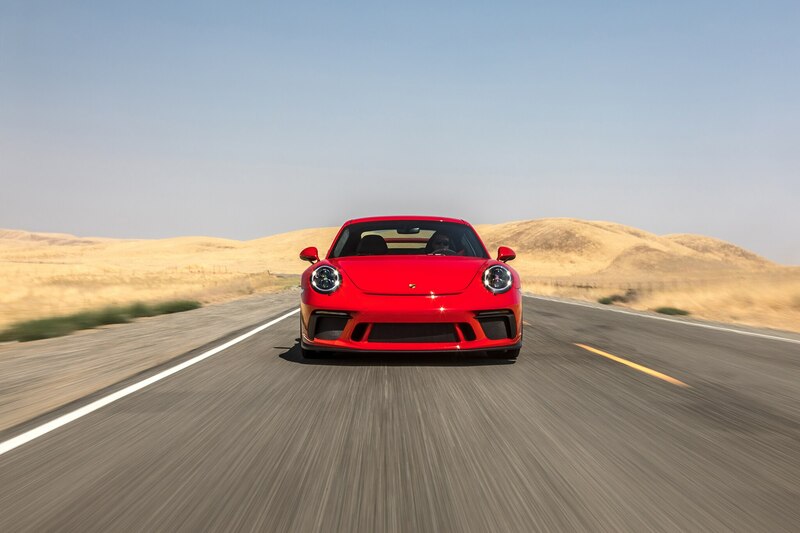 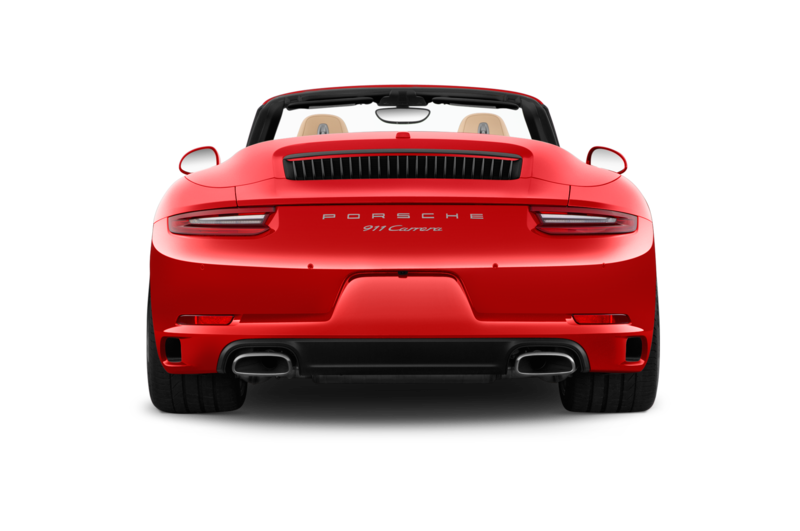 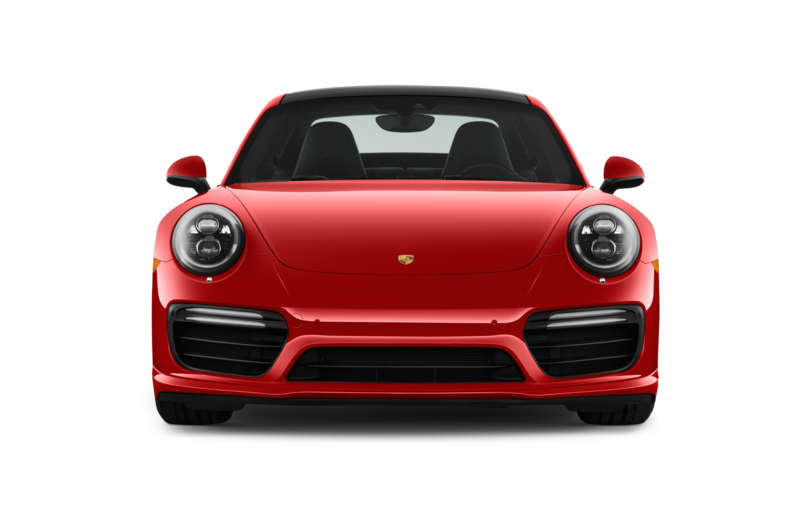 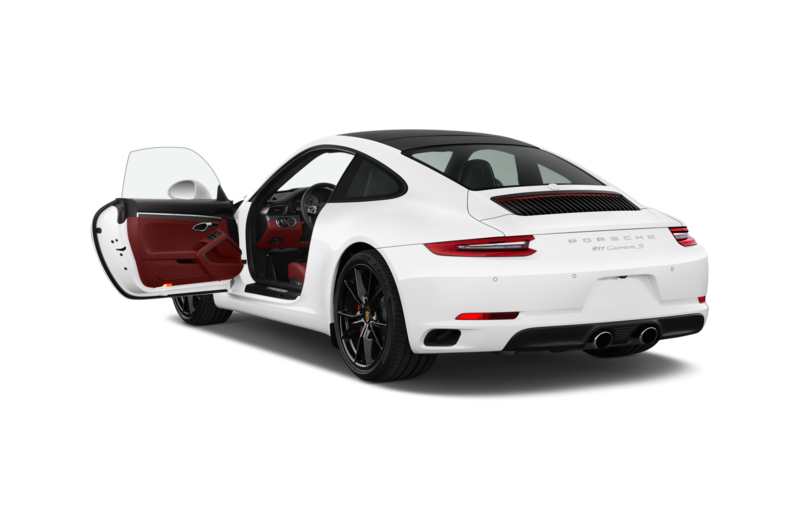 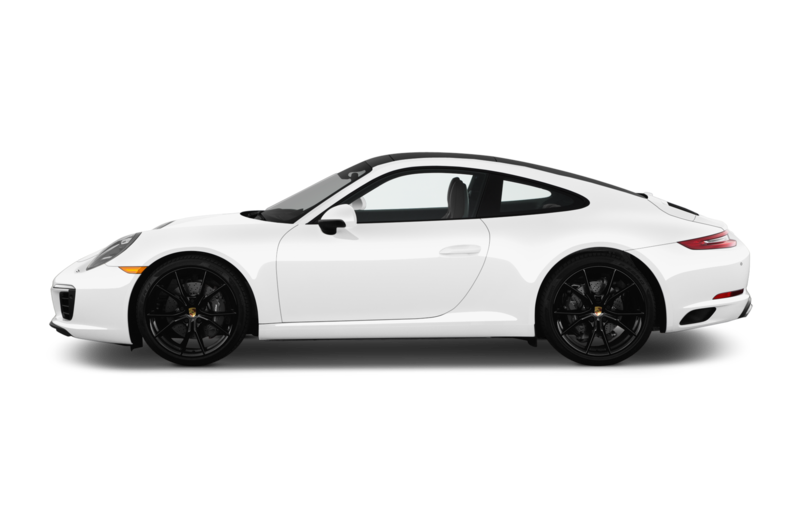 Put that $400,000 to better use by picking up a 2018 Porsche 911 GT3 with the same transmission and better engine. 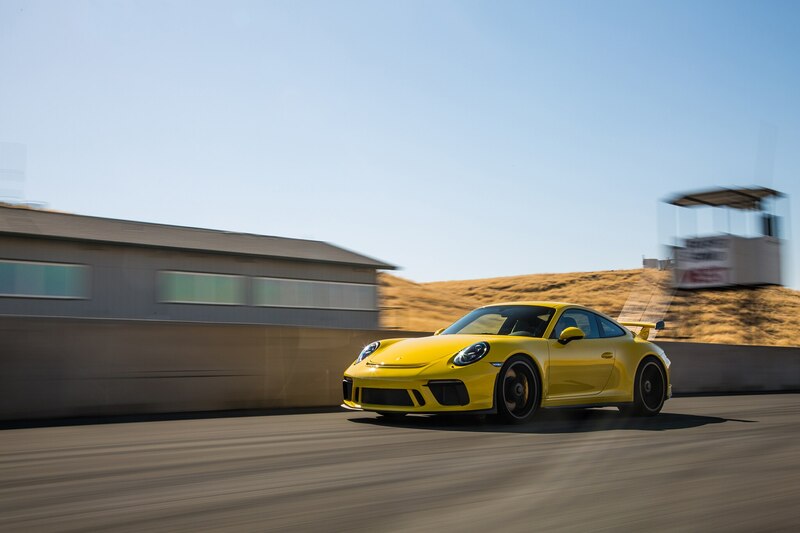 The $260,000 you’ll have left should buy you many, many laps around Thunderhill.